Click on any of the attractions below for more information. 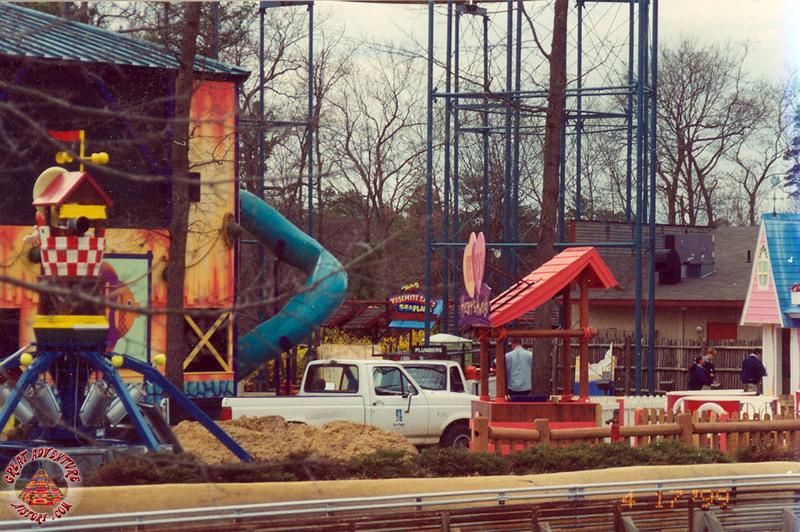 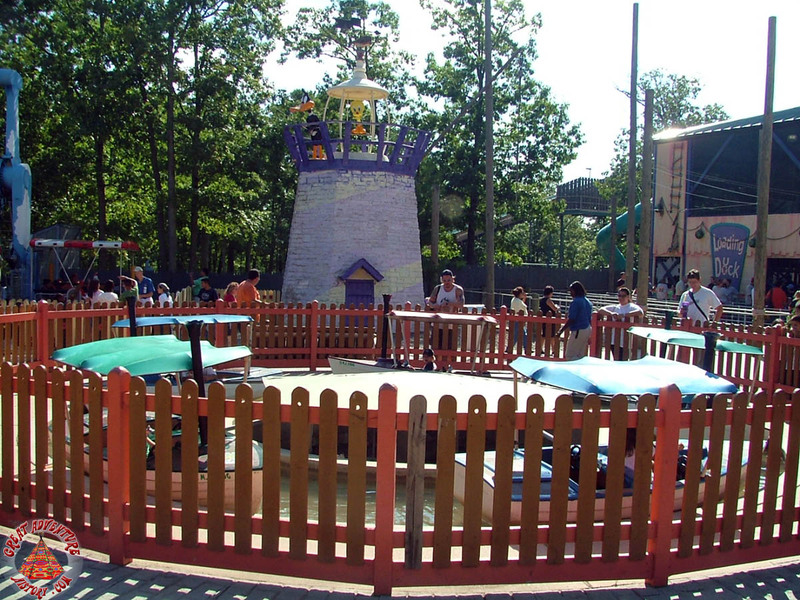 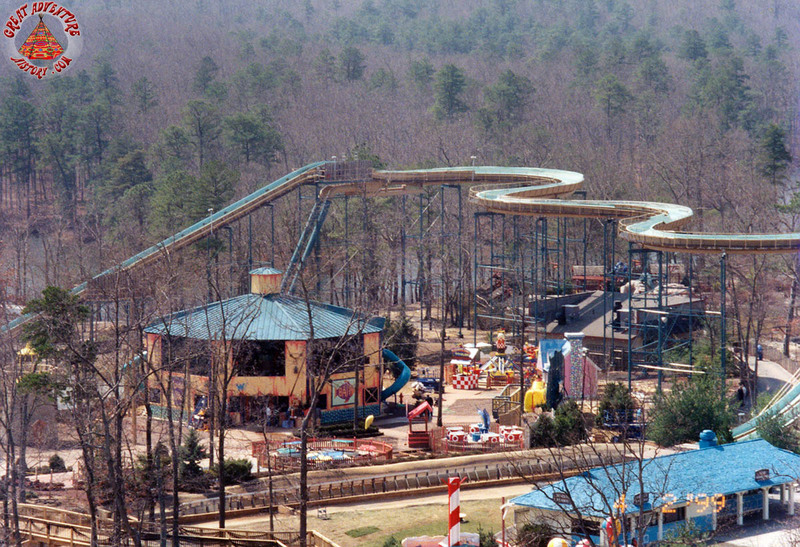 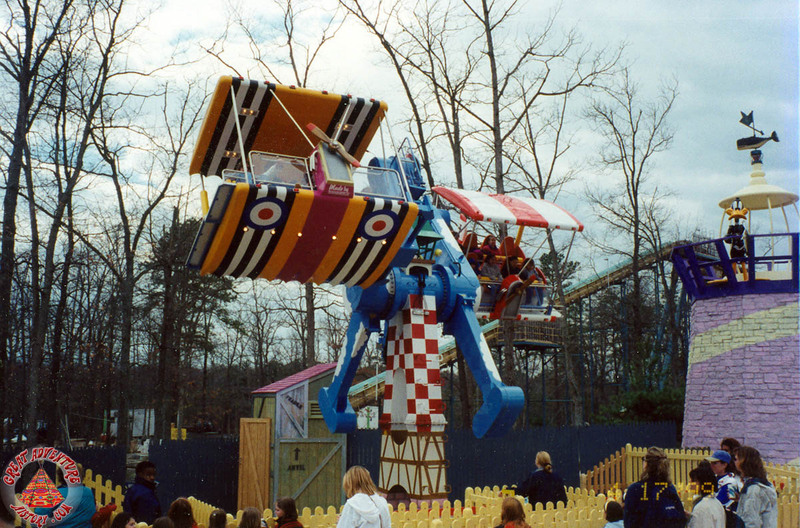 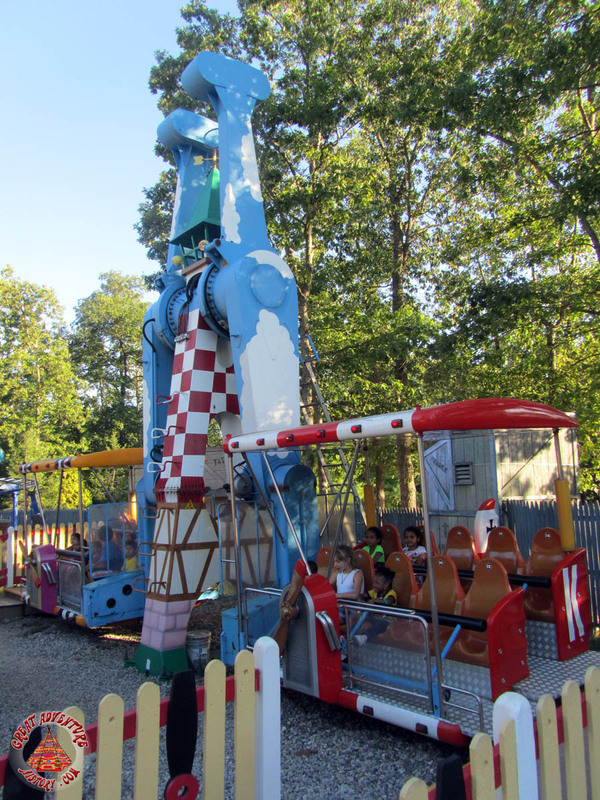 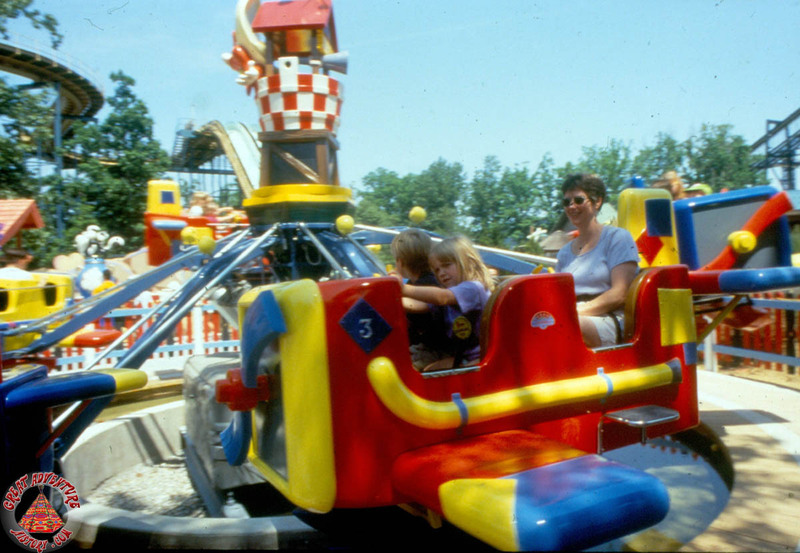 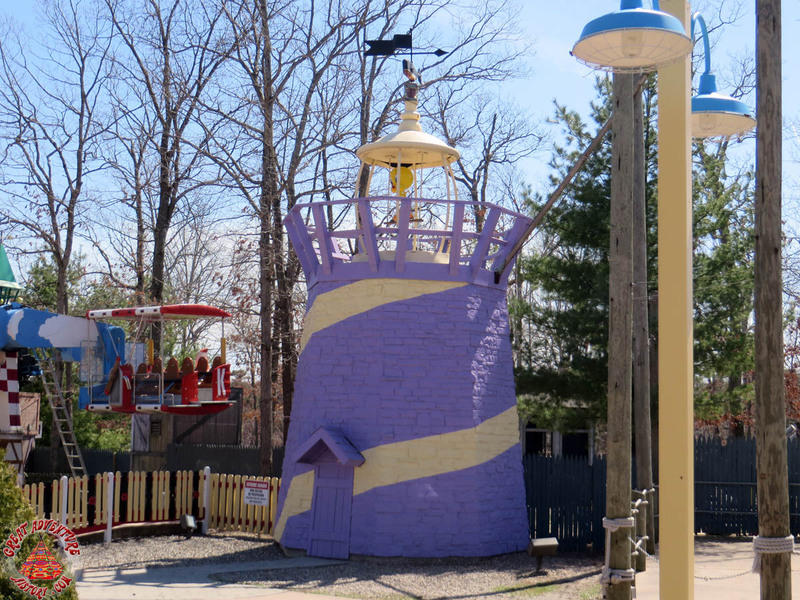 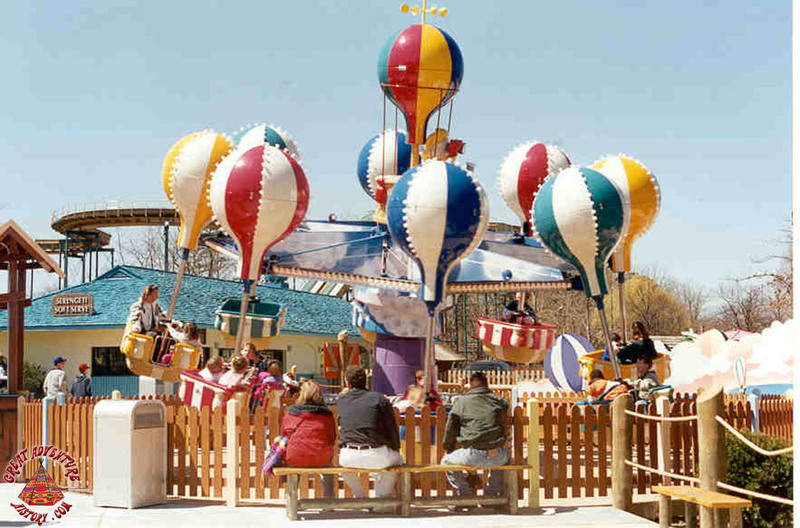 Since opening day in 1974, Great Adventure was always the home to a single area of the park dedicated to kids and the fun they could have riding around on scaled-down versions of the park's larger rides. 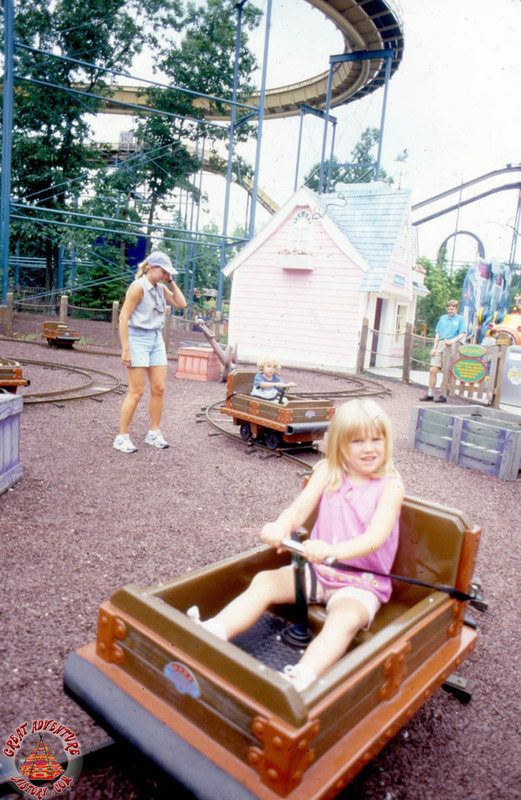 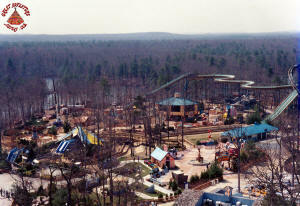 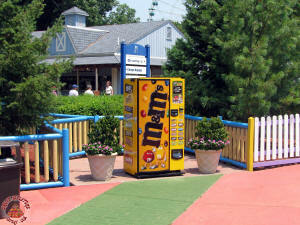 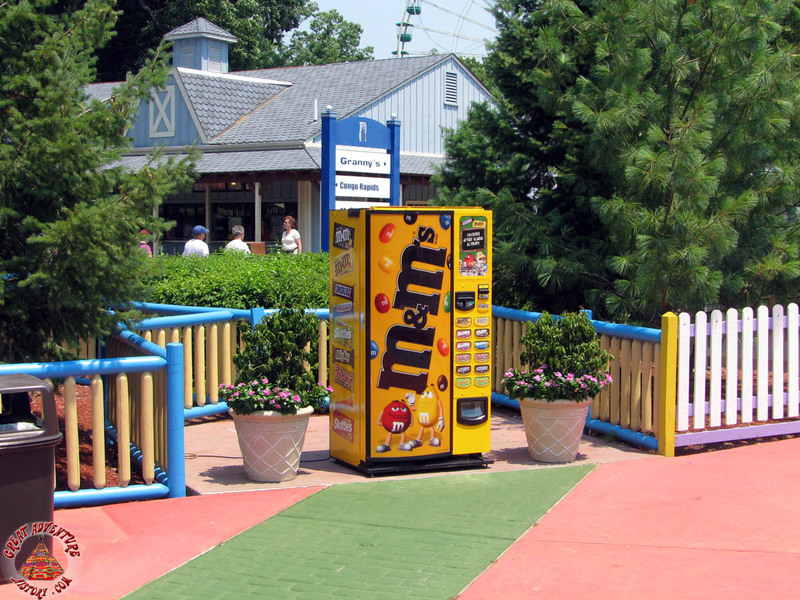 All that changed in 1999 as a second section of pint-sized thrills was added as part of a major park-wide expansion known as the "War On Lines." 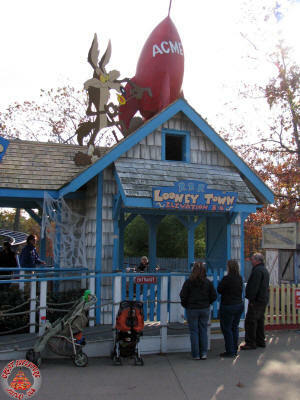 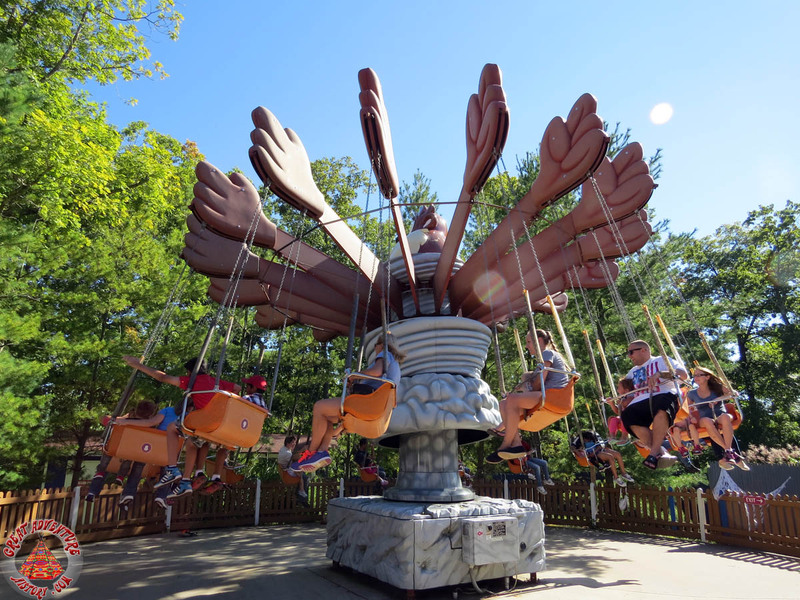 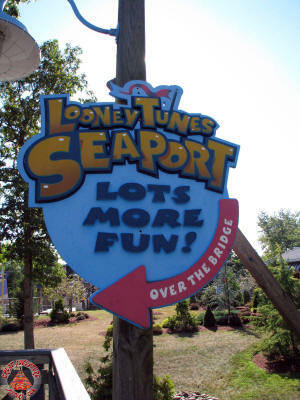 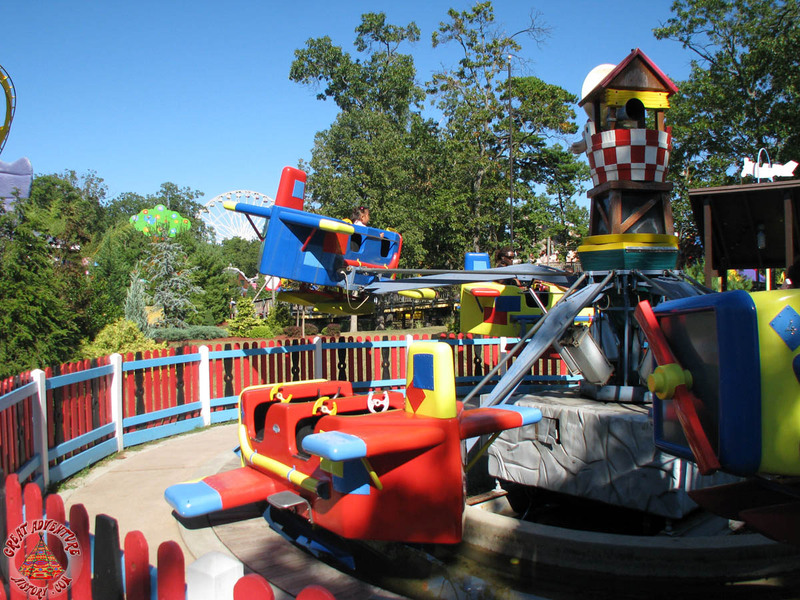 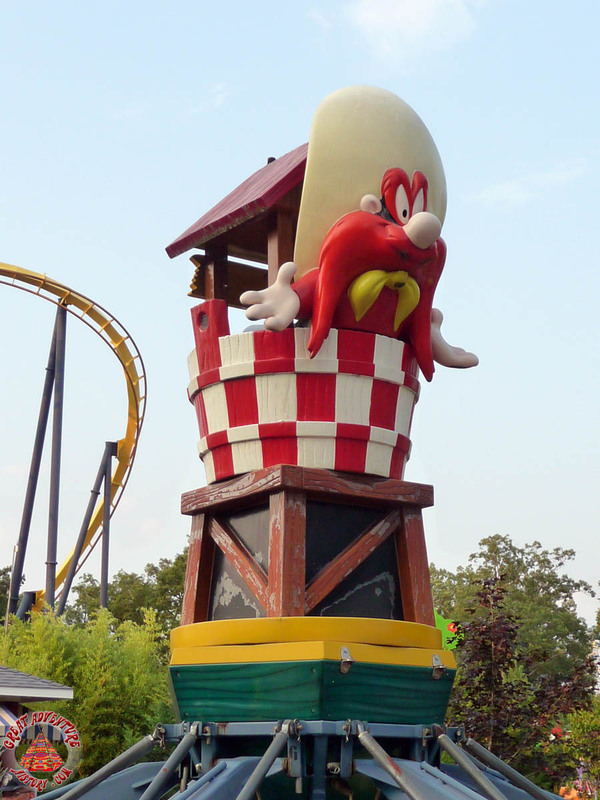 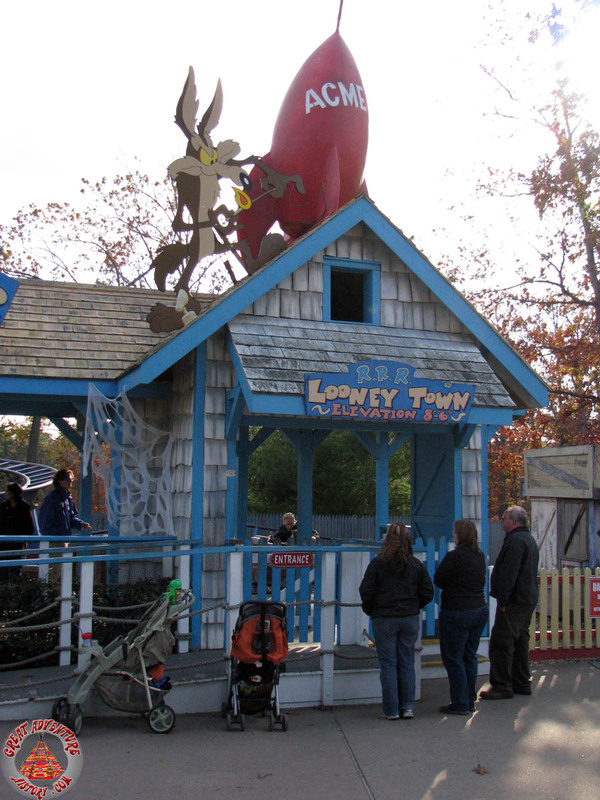 Over 27 new rides and attraction were added to Great Adventure in a single season including the new Looney Tunes Seaport with its eleven new rides and numerous supporting attractions aimed at Great Adventure's smallest guests. This seaside port offered rides which could be enjoyed by children with their parents riding right along with of them, something which was not possible on the older kiddie rides found in Bugs Bunny Land. 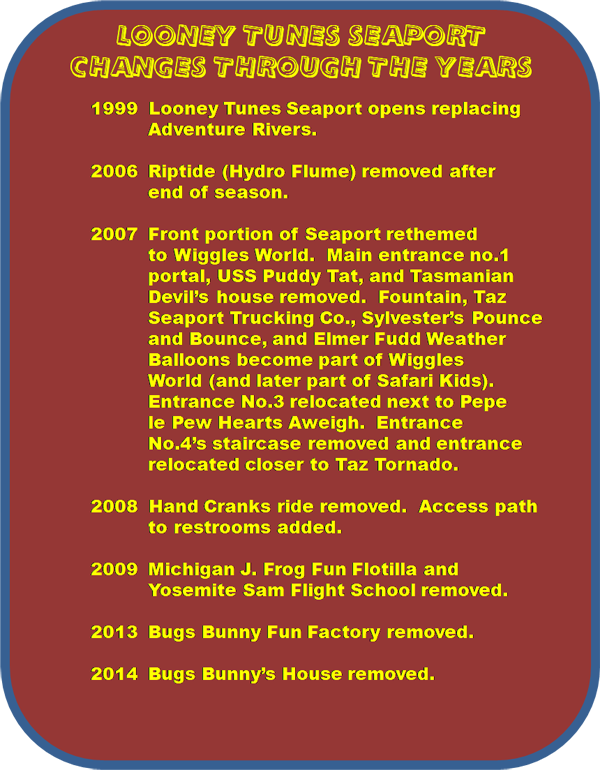 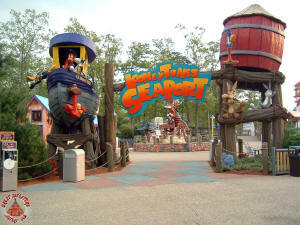 Here is an overview of Looney Tunes Seaport and the changes it has experienced over the years. 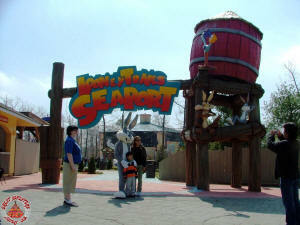 The main entrance to the Seaport was an elaborate portal that helped to establish the nautical feel of the section. 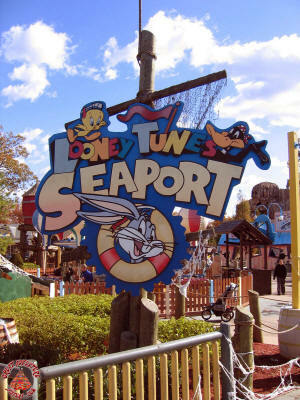 A giant tugboat and a water tower were joined together by a big Seaport logo with the Looney Tunes scattered around the structure. 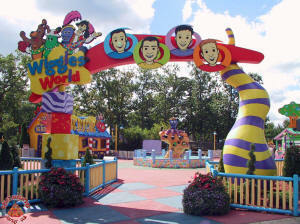 The sign was removed when Wiggles World opened in 2007, and now the two halves of this sign now sit separately at the far end of the Seaport near the entrance to Congo Rapids. 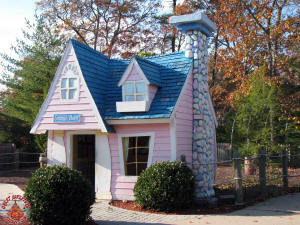 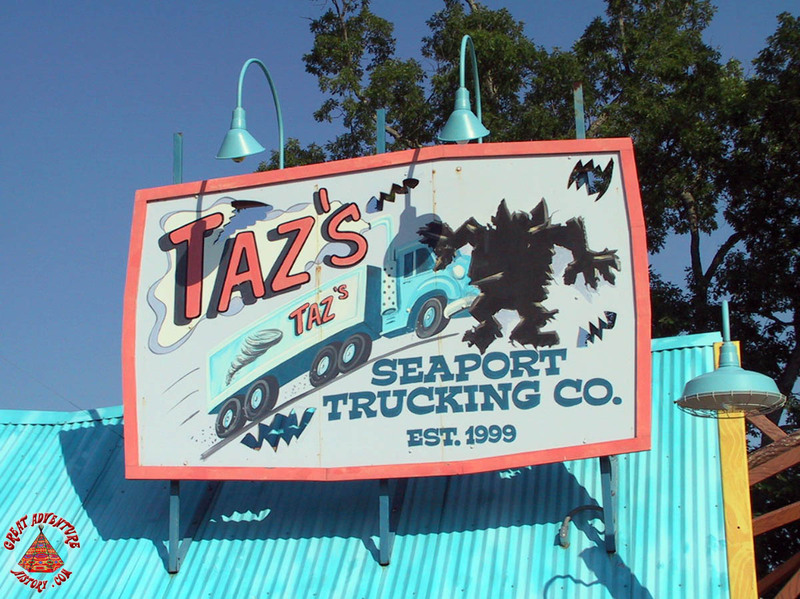 Taz’s house was one of the four interactive Looney Tunes houses within the Seaport. Modeled after shipping crates, the house’s doorway appeared as if it was broken down by the Tasmanian Devil himself. The house was removed in 2007 as the front half of the Seaport was transformed into the Wiggles World area. 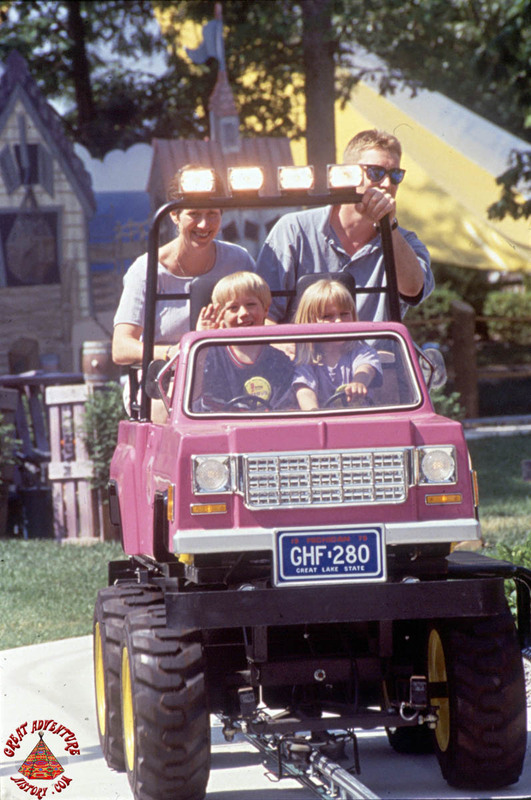 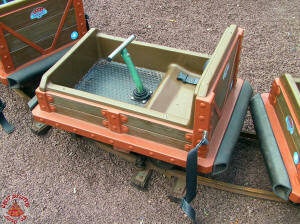 Similar to the park’s former Antique Cars, the Seaport trucks offered a gentle ride in cargo-style vehicles that parents and children could enjoy together. Following the redevelopment of the Seaport, the trucks became the Big Red Cars for Wiggles World, and expedition buggies as part of Safari Kids. 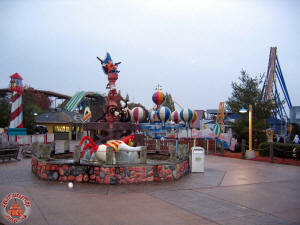 Relocated from Frontier Adventures, the centerpiece for this new-for-1999 fountain was placed at the center of the Seaport. The fiberglass statue was often prone to icicles and freezing during the offseason and early spring weeks. 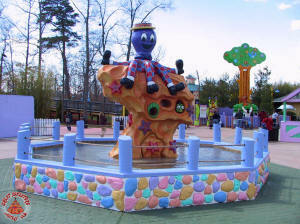 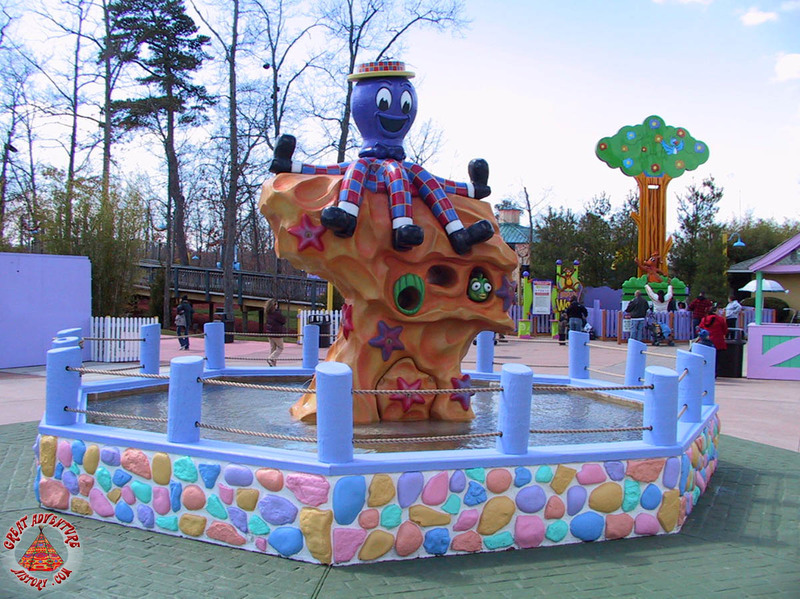 Remodeling of the fountain’s centerpiece came in 2007 and 2011 for the overhaul into Wiggles World and Safari Kids respectively. 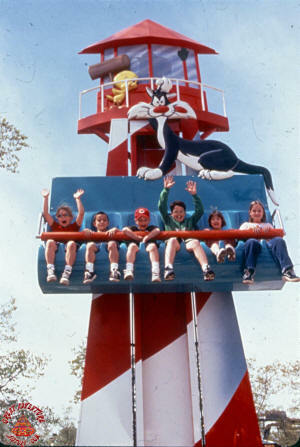 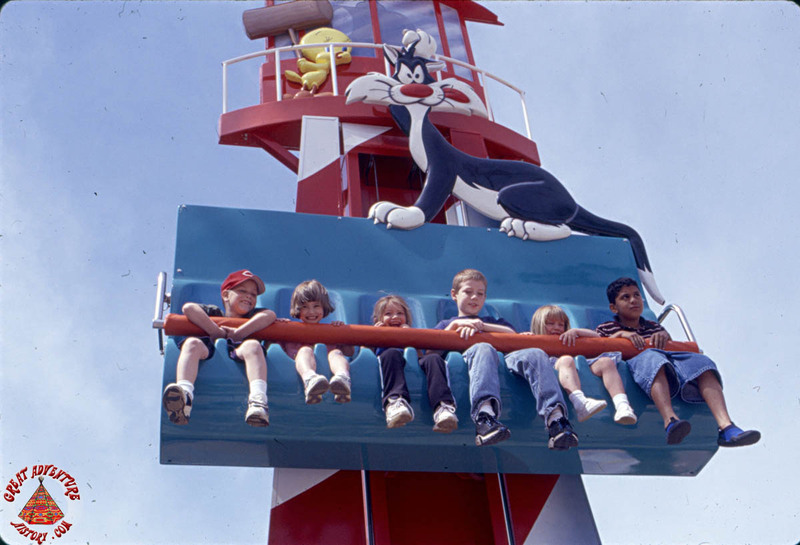 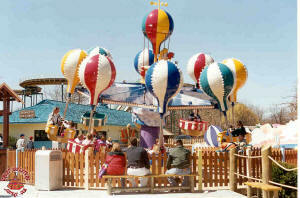 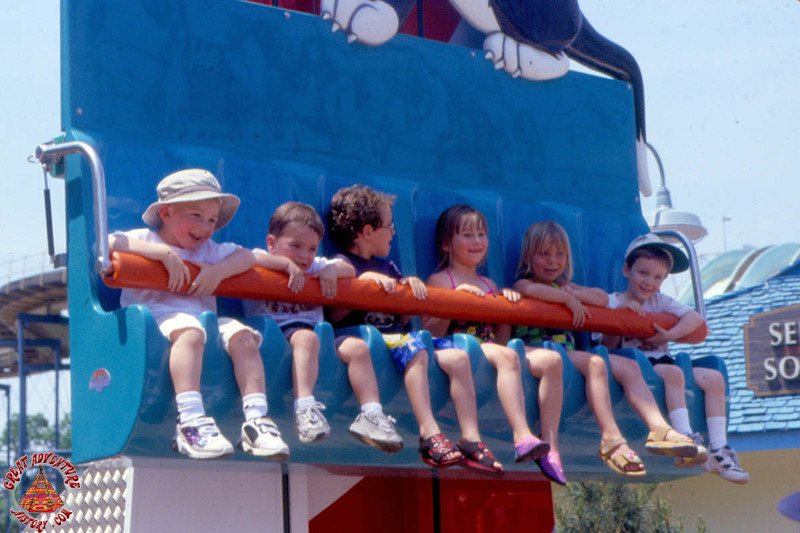 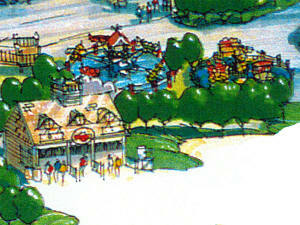 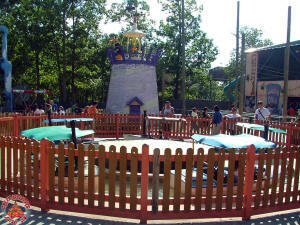 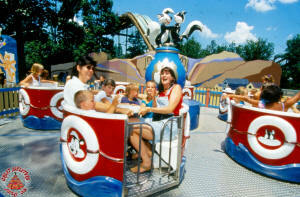 The Pounce and Bounce was a scaled-down drop style ride added near the Seaport Fountain in 1999. 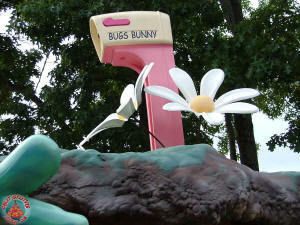 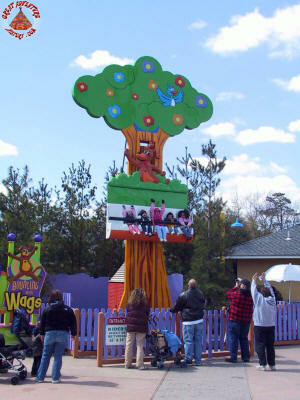 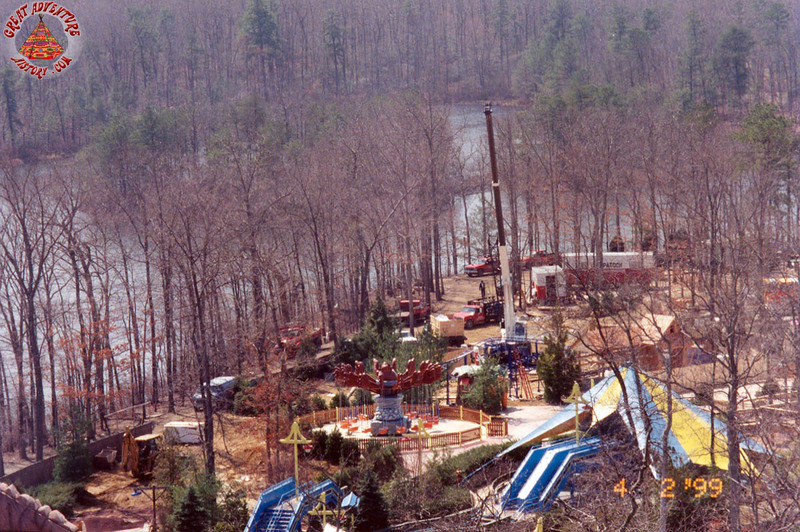 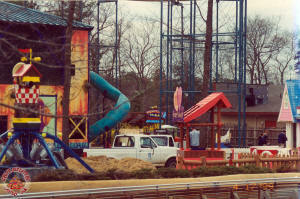 The ride was rethemed and became Bouncin’ With Wags and later Jumpin’ Joey. 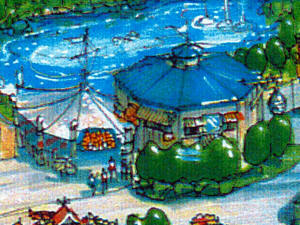 Facing toward Nitro, the second entrance sign featured the advertised logo for the Seaport against the “mast” of a ship. 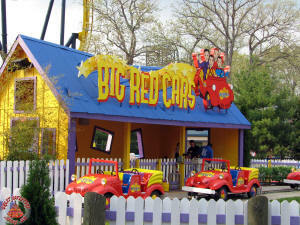 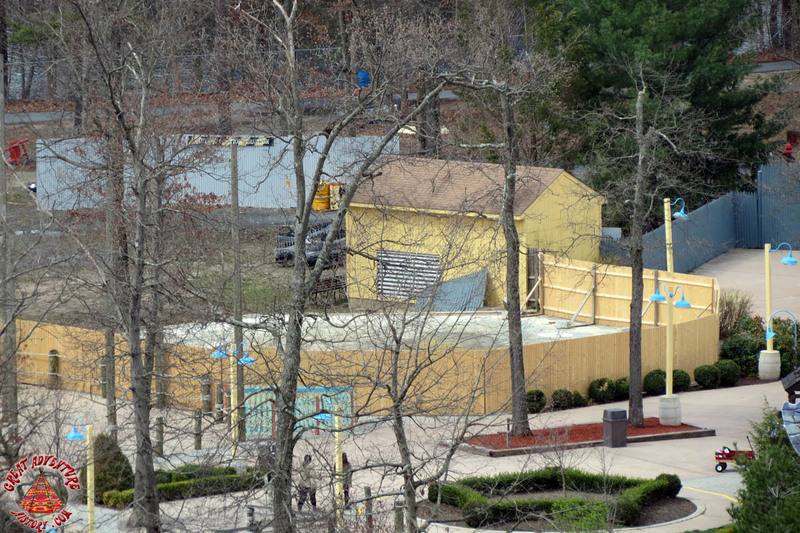 The sign had a painted facade and sat directly across from the current site of the Nitro ride lockers. This Zamperla balloon ride originally featured a fiberglass Elmer Fudd statue at its center. 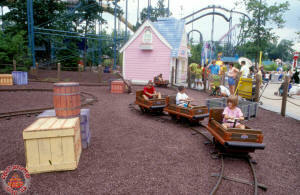 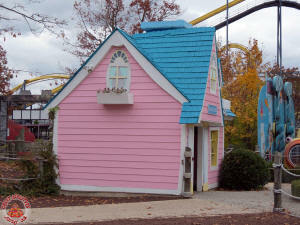 The ride was later rethemed as Dorothy’s Racing to the Rainbow and Sky Zooma. 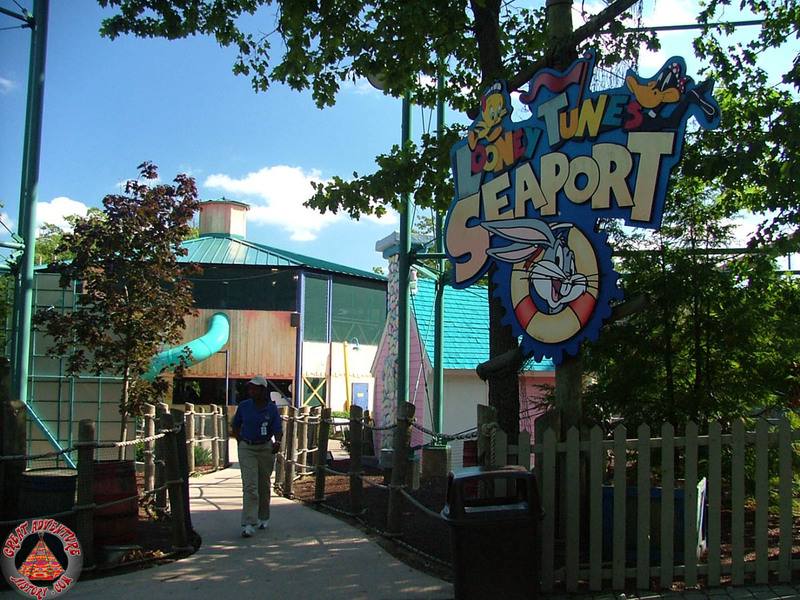 The Seaport Bridge was built to allow guests access to the back half of the Seaport Section. 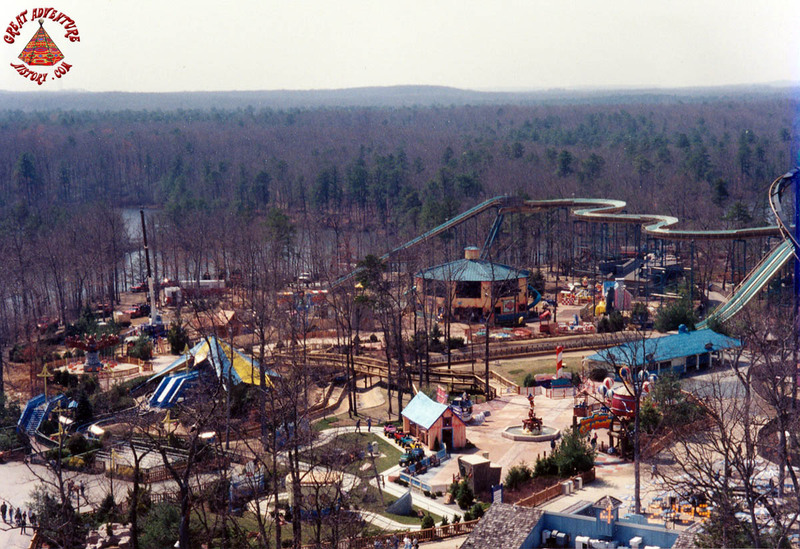 Built over the final trough of the Hydro Flume (1975-2006), the bridge had a nautical theme with life-preservers and buoys lining its perimeter. 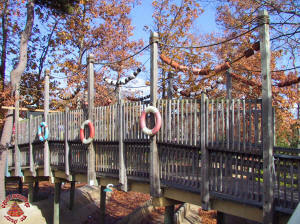 The bridge had its own sign at the front advertising the collection of rides on its other side. 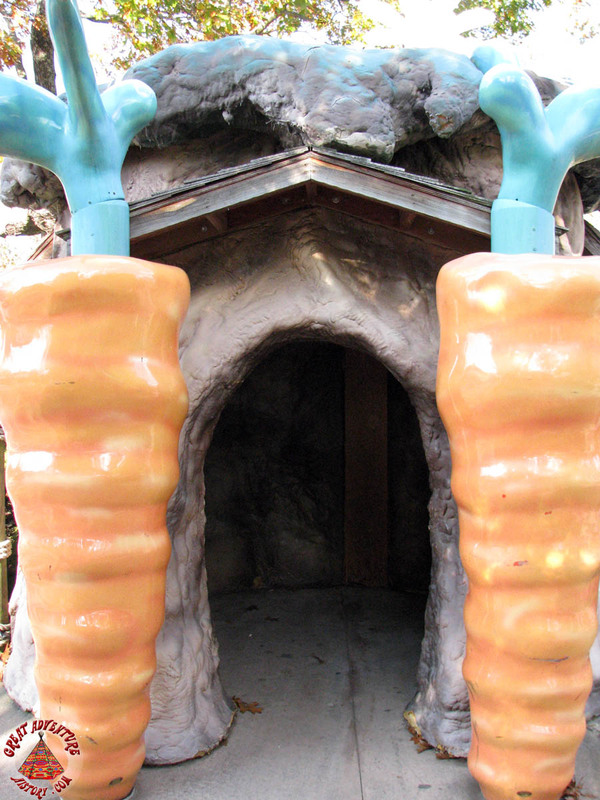 Another one of four Looney Tunes houses, Bugs’ house was modeled to look like it was underground in a rabbit hutch. 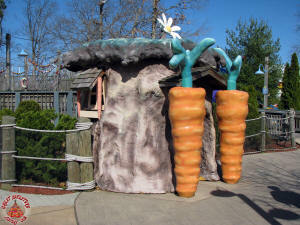 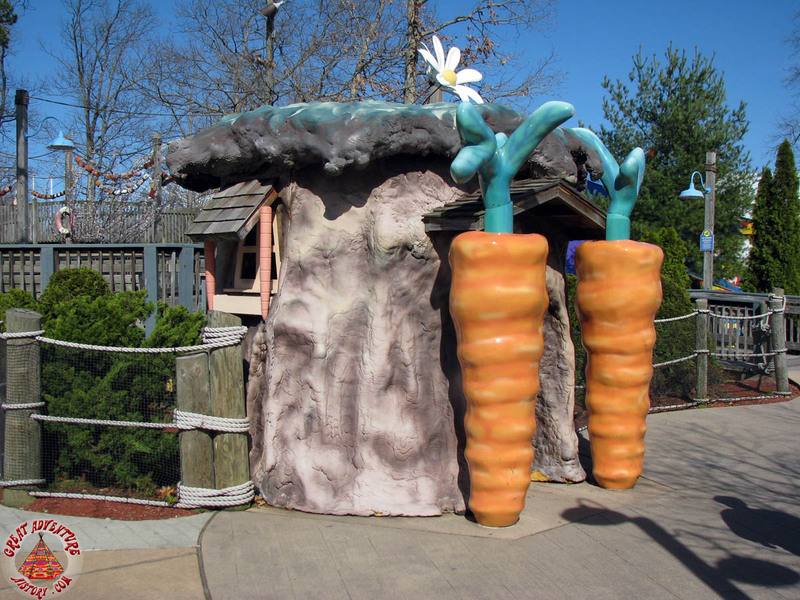 The door was marked by two giant carrots and featured flowers and a mailbox on top of the structure. For unknown reasons, the house was removed in 2014 to a backstage area with its outline still visible on the site where it once stood. 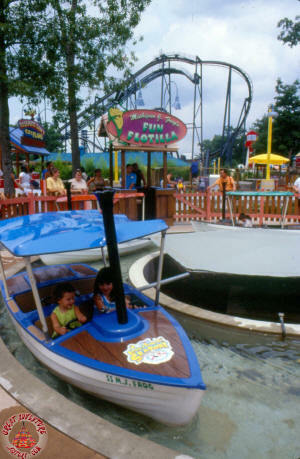 The Fun Flotilla was Great Adventure’s second boat ride with elaborately themed jungle excursion boats that spun slowly around a center canopy. 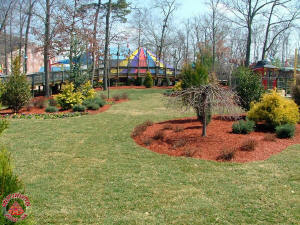 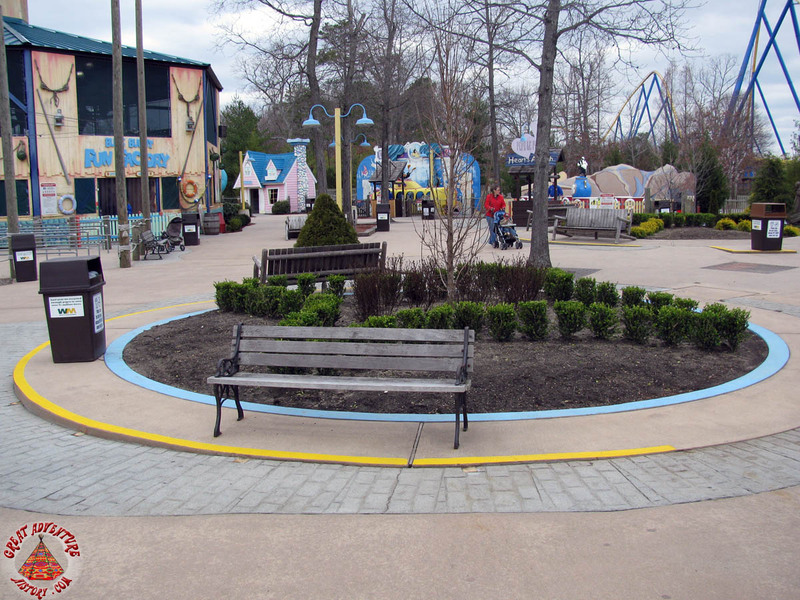 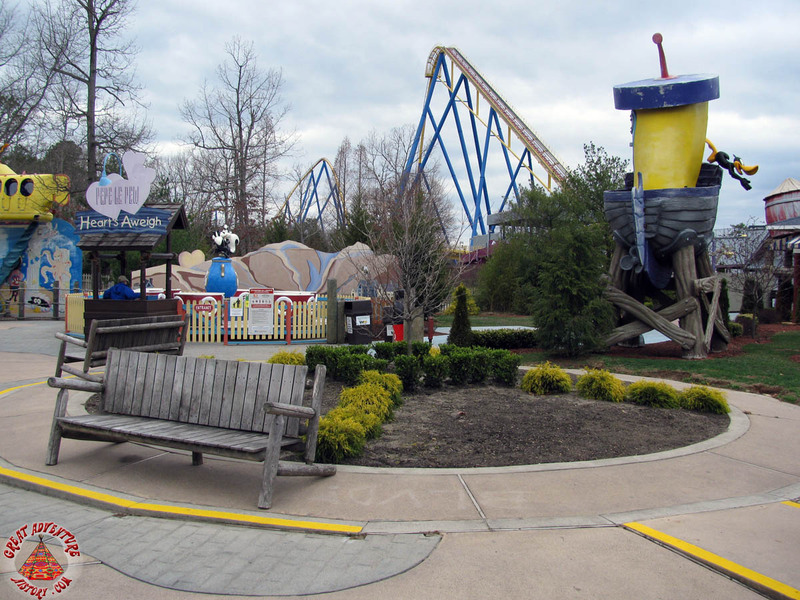 Removed in 2008, the former site of the boat ride is now a landscaped patch of shrubbery with benches surrounding it. One of Great Adventures many plane-ride variants, the Seaplanes were located next to Michigan J. Frog. 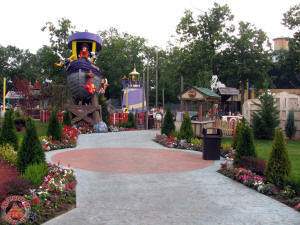 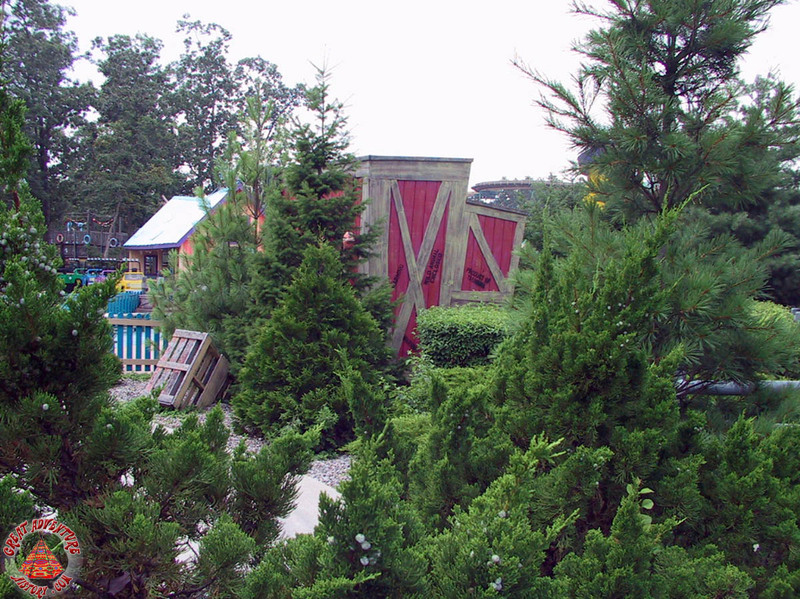 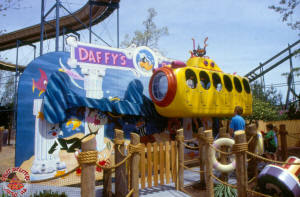 Like it’s neighbor, the ride was removed in 2008 and replaced with a similar looking landscaped display. 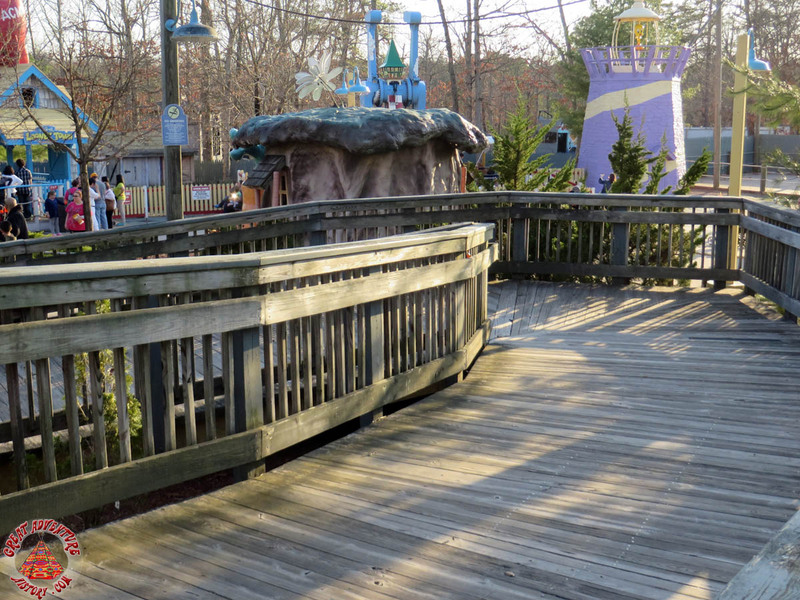 These mini-teacups are located near the back end of the Seaport. 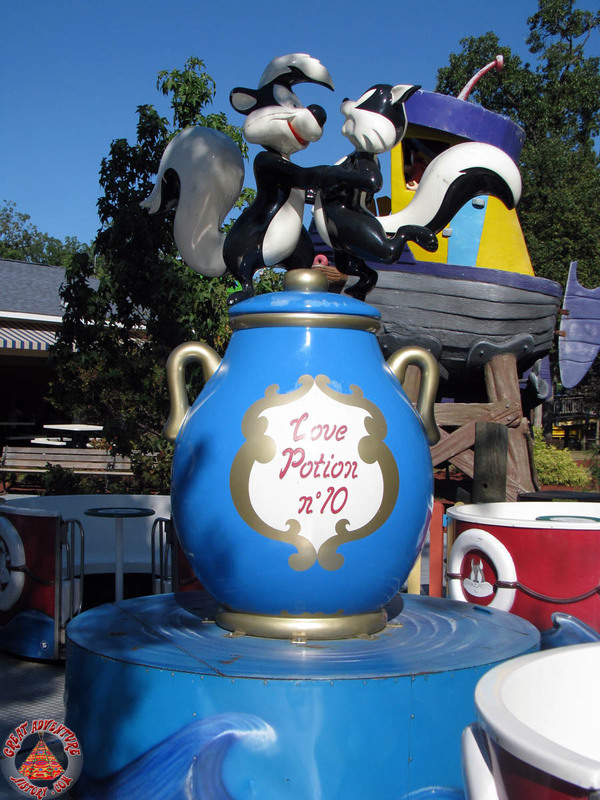 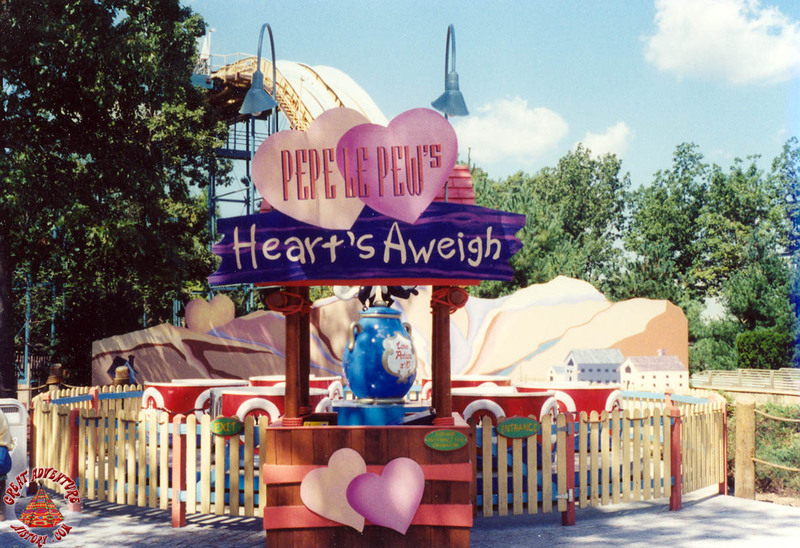 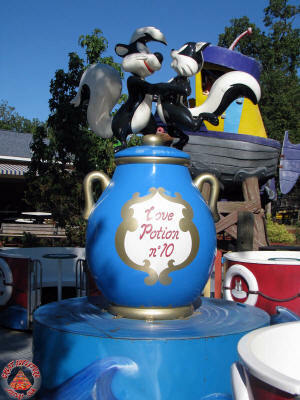 A scaled down version of the park’s main teacup ride, this model features a fiberglass centerpiece of Pepe Le Pew and Penelope the cat. Originally, a fiberglass marlin fish occupied the center of the ride. 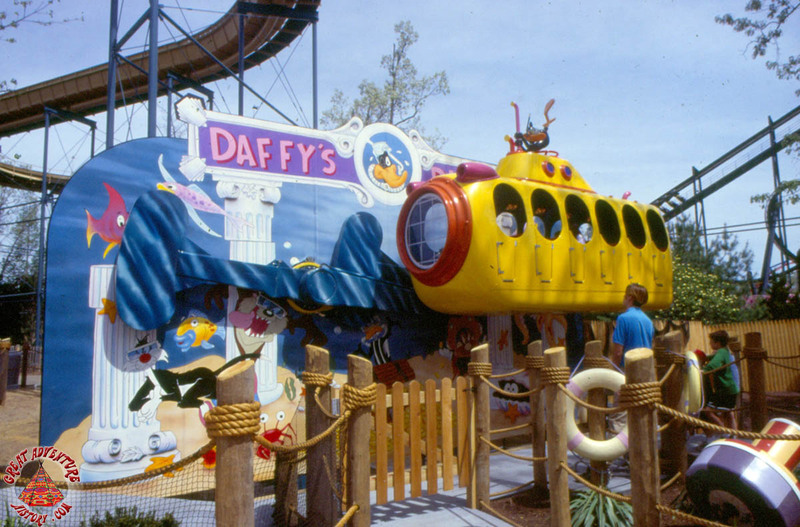 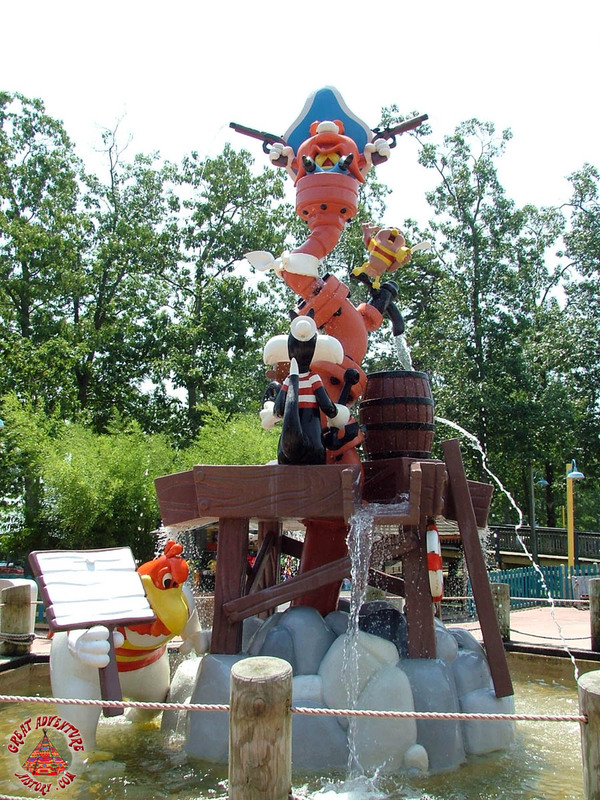 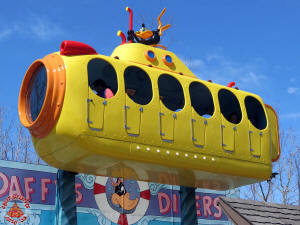 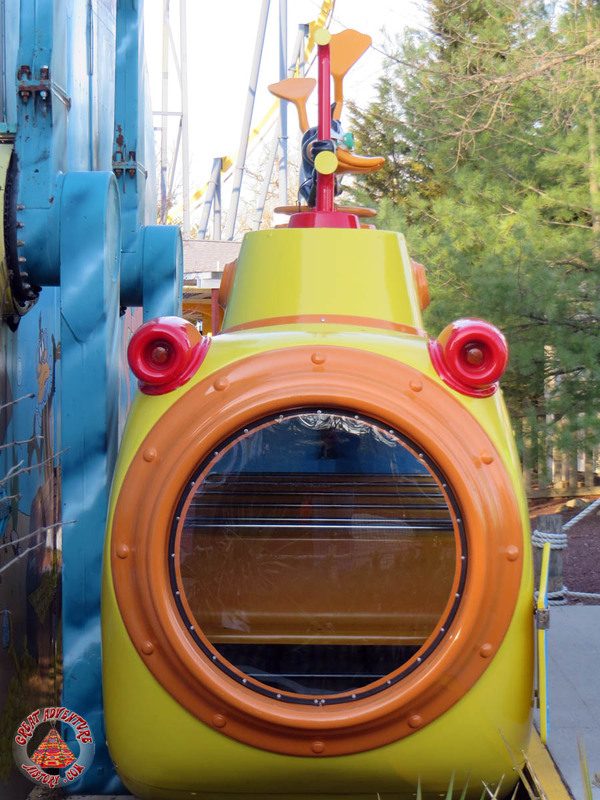 Similar to the standard “Crazy Bus” style ride is Daffy’s Deep Sea Diver. The ride is modeled vaguely after the famous Yellow Submarine and is a popular ride in the back half of the Seaport next to Pepe Le Pew. 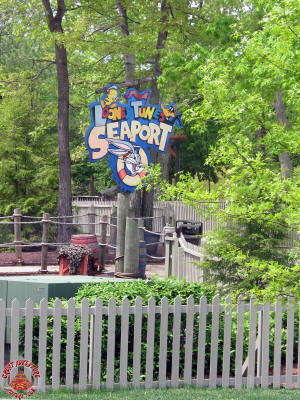 Almost identical to the second entrance, the third entrance featured a similar painted sign to direct guests to the back half of the Seaport. 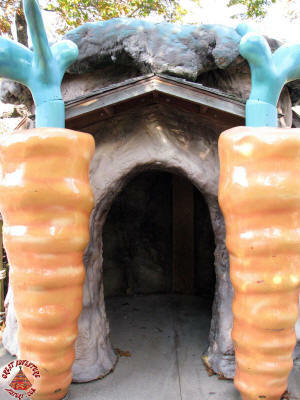 This entryway was located near Congo Rapids and the former site of Koala Canyon. 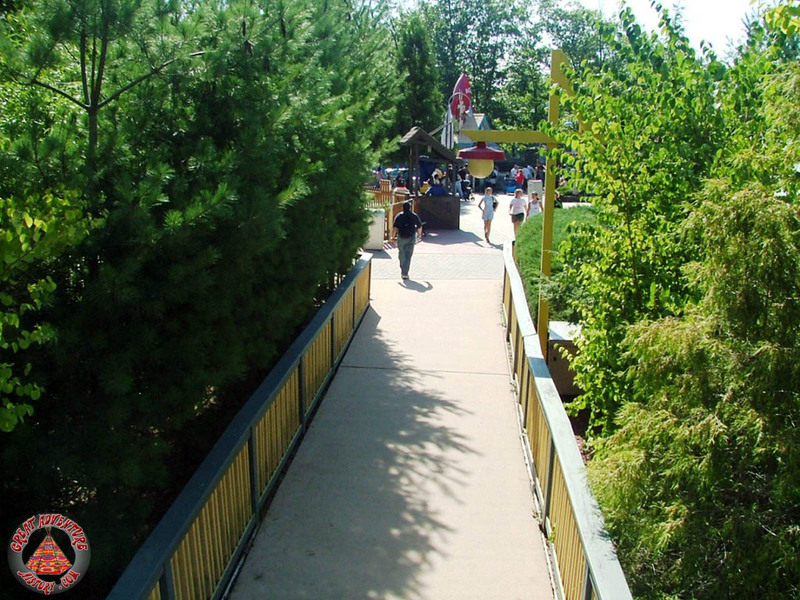 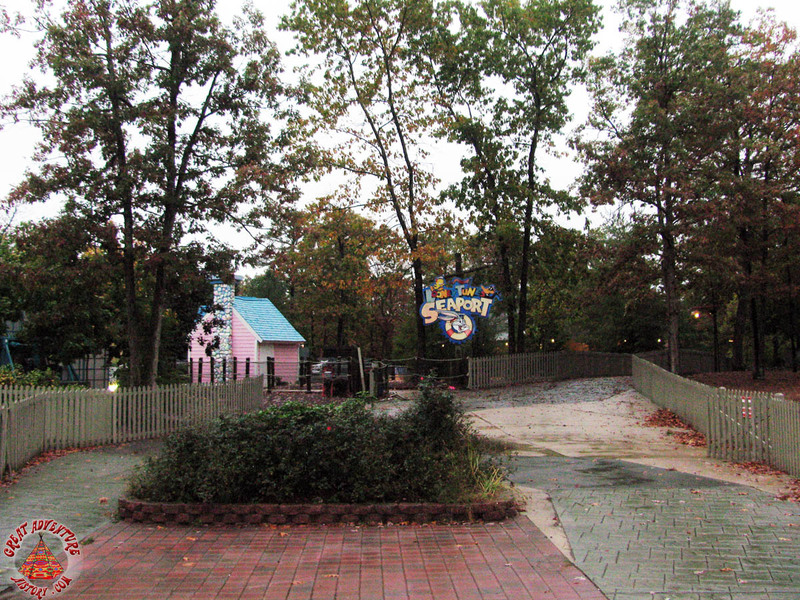 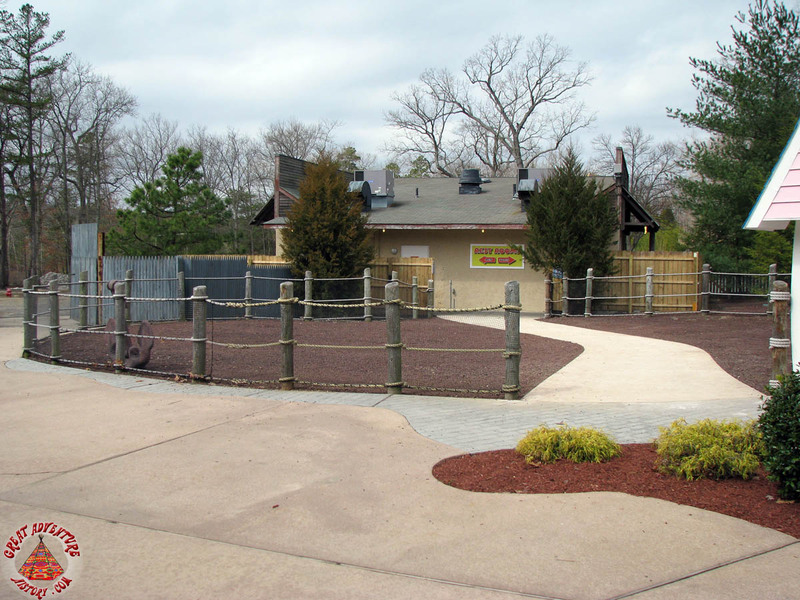 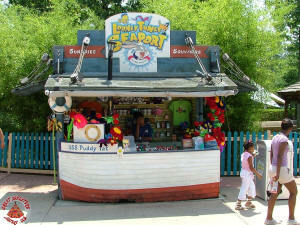 This entrance was removed when Koala Canyon closed for 2007 and a new entrance way was added next to Seaport Eats. Next to Daffy’s Deep Sea Diver sits Granny’s House. This building is one of the Seaport’s most vibrant facades, with a bright pink facade and neon rockwork for the fireplace and chimney. 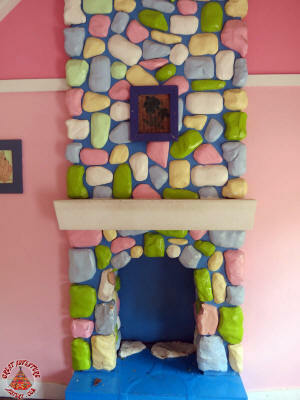 Looney Tunes music can be heard playing form the speaker disguised as a photo above the fireplace mantle. 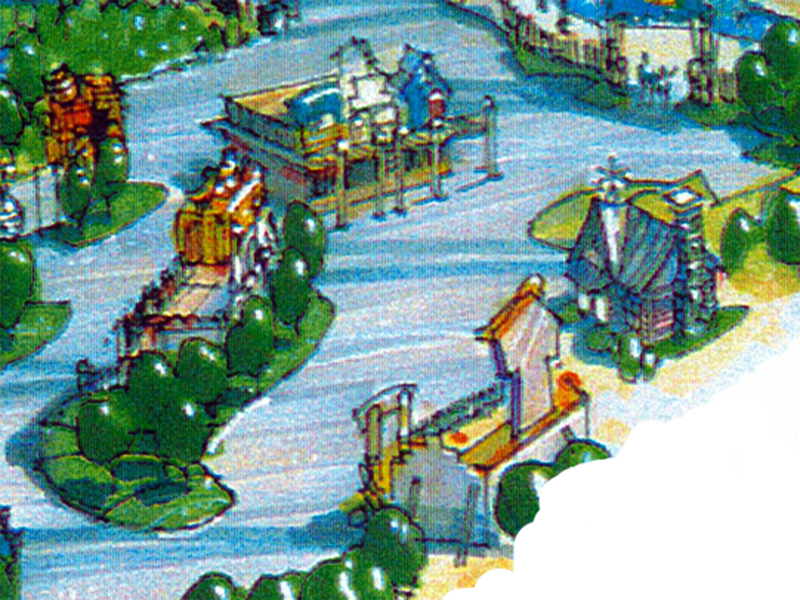 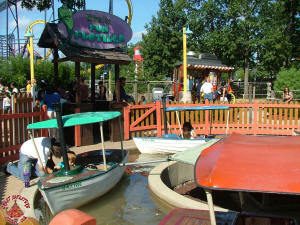 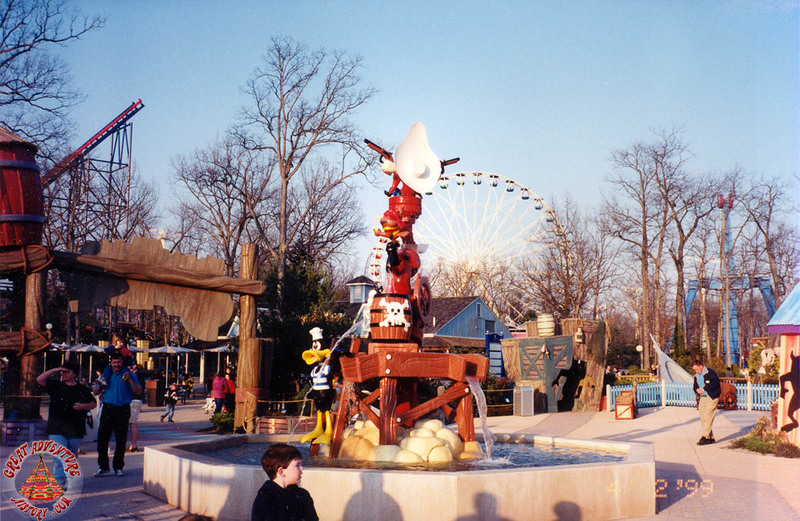 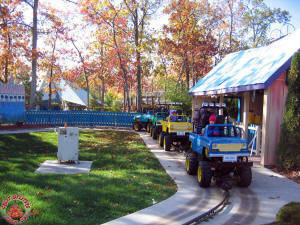 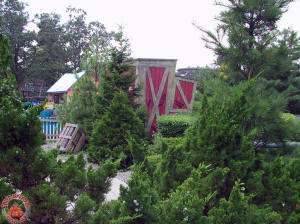 With loose Seaport theming, the Hand Crank was a unique ride and completely guest powered. 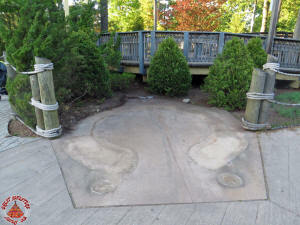 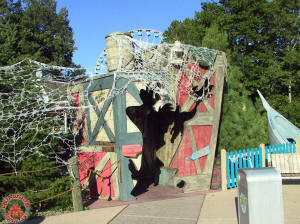 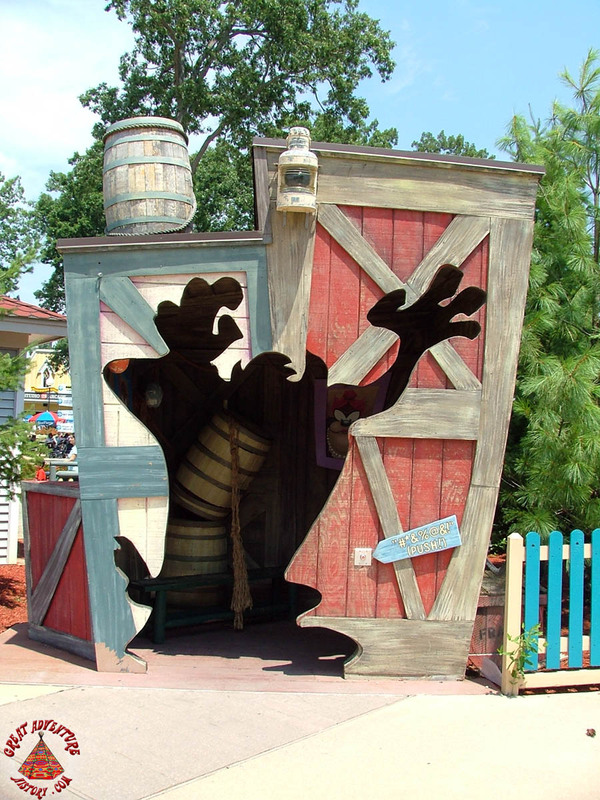 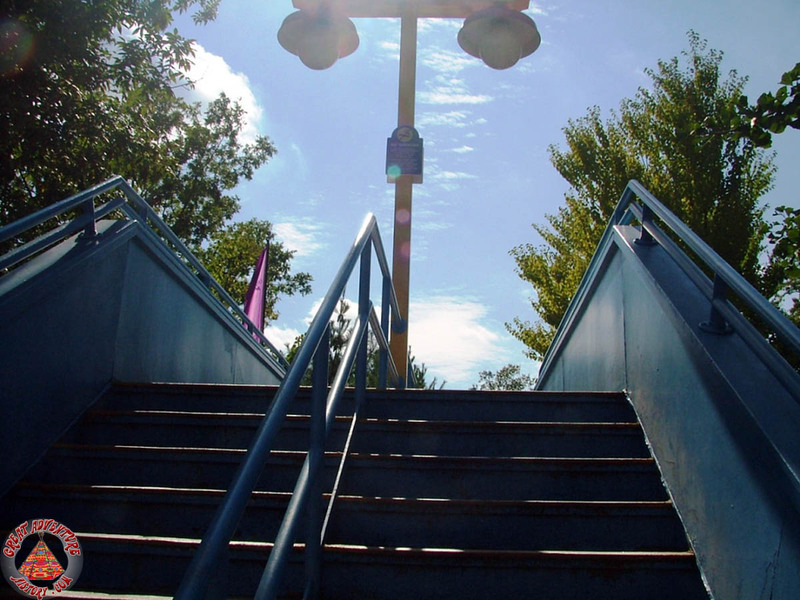 The ride was removed in the 2007 season, and the ride’s footprint was reworked to serve as a pathway to the former Koala Canyon restrooms. 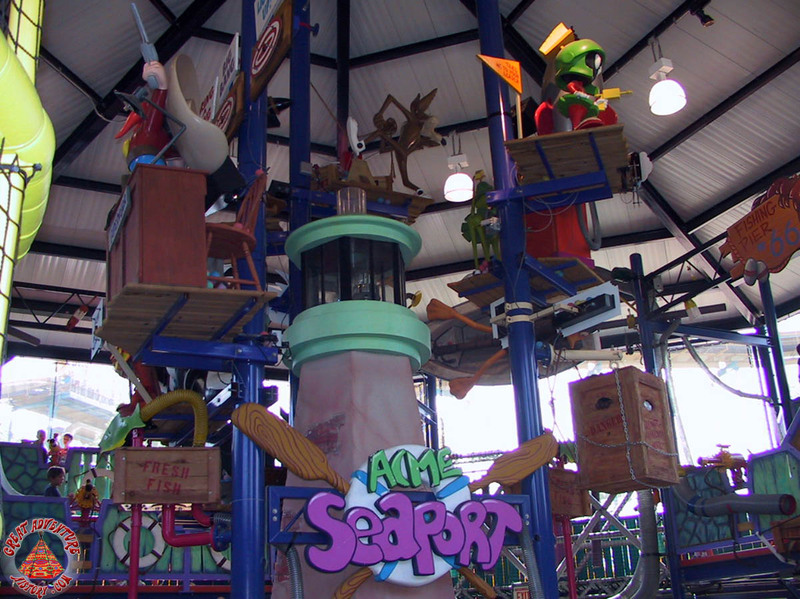 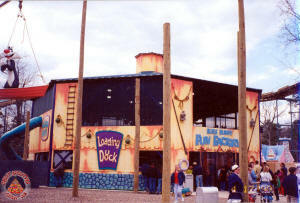 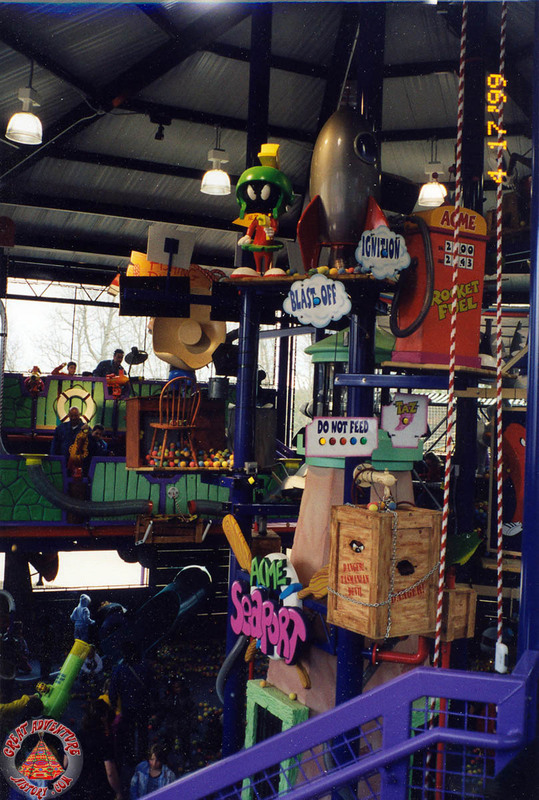 The Fun Factory was a multi-level play structure located in the back of the Seaport. 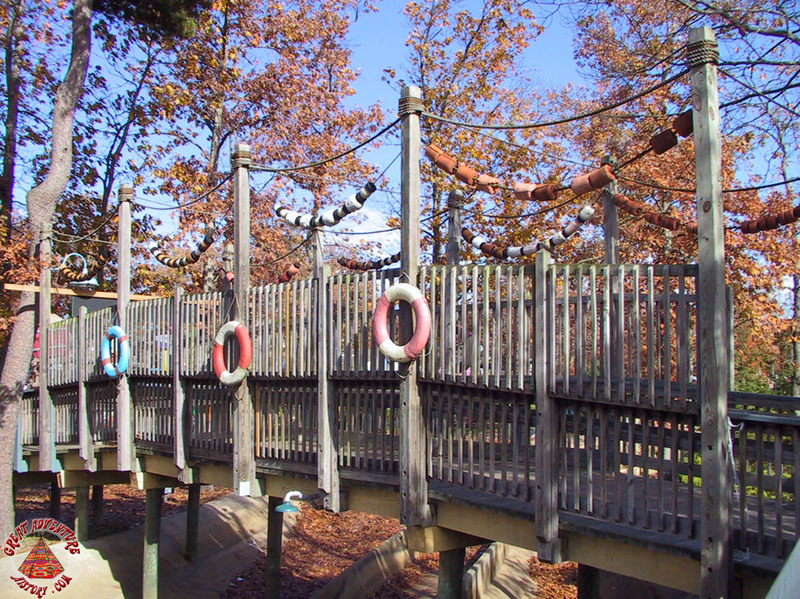 It was home to slides, climbing structures and ball pits. 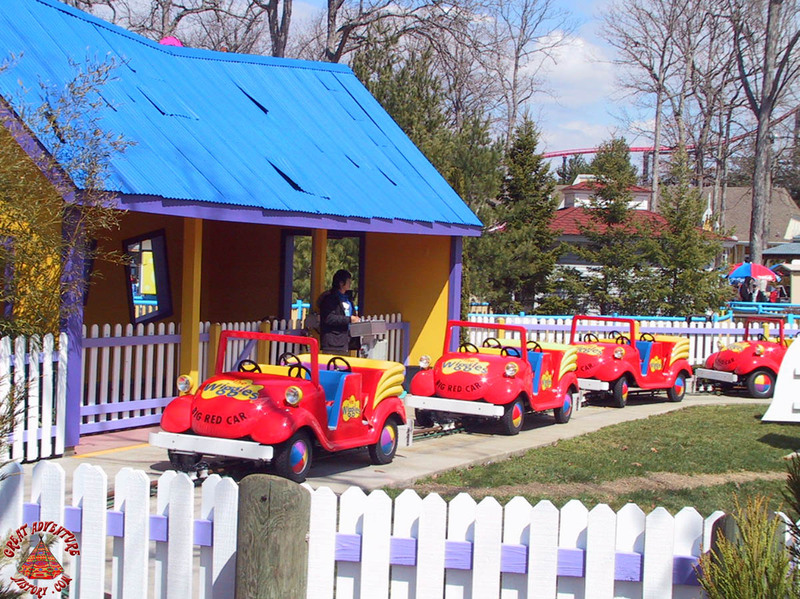 Removed in 2012, the site of the Fun Factory was once rumored to become home to the park’s kiddie train (Bugs Bunny Great Western Rail Road/Jungleland Express), though plans for it never materialized. 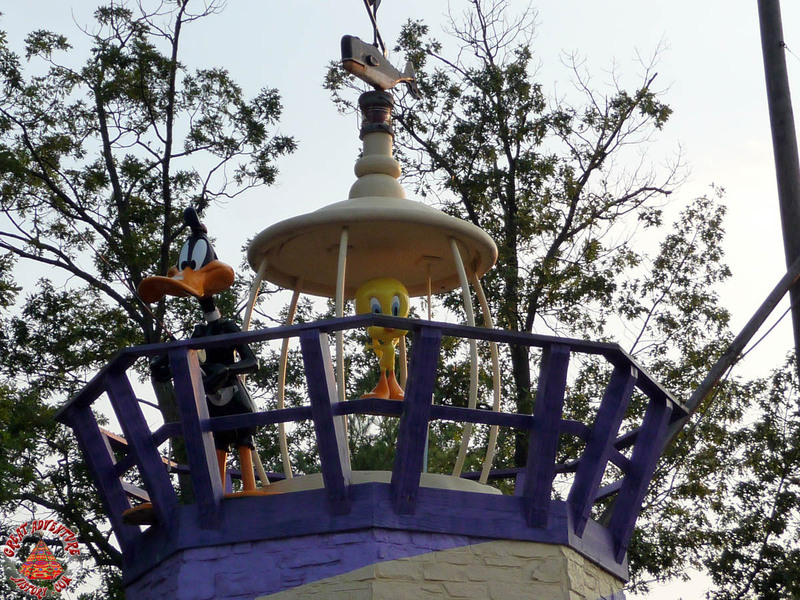 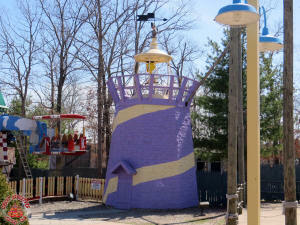 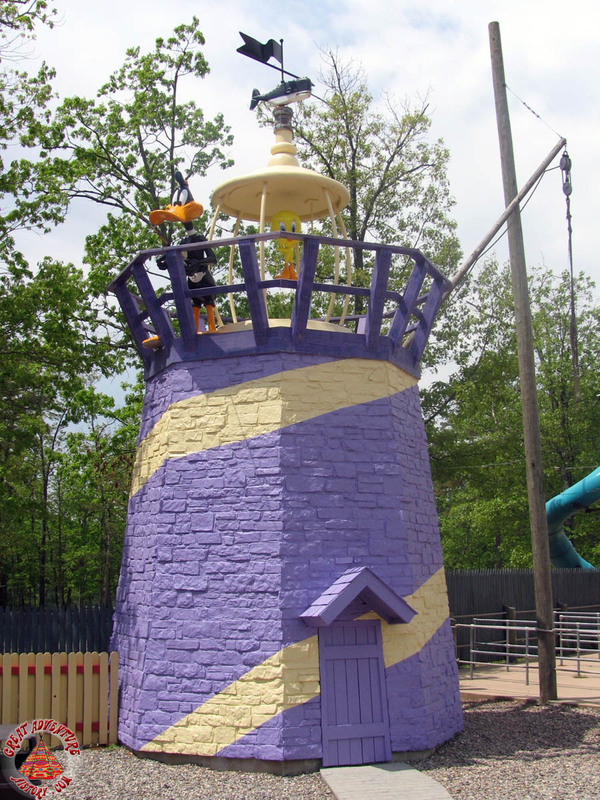 The fourth and final house of the Seaport, the interior of Daffy Duck’s Lighthouse is not accessible to guests. It is almost purely decorative, but used for employee and utility storage. 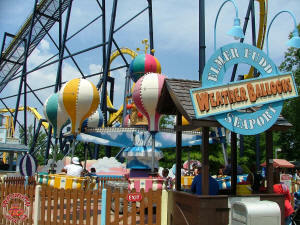 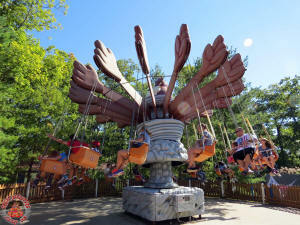 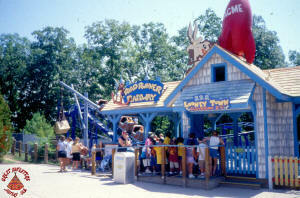 A popular addition, the Barnstormer is a favorite among park goers as a thrilling children’s ride. Two biplanes circle up and down next to the lighthouse in the back portion of the Seaport. 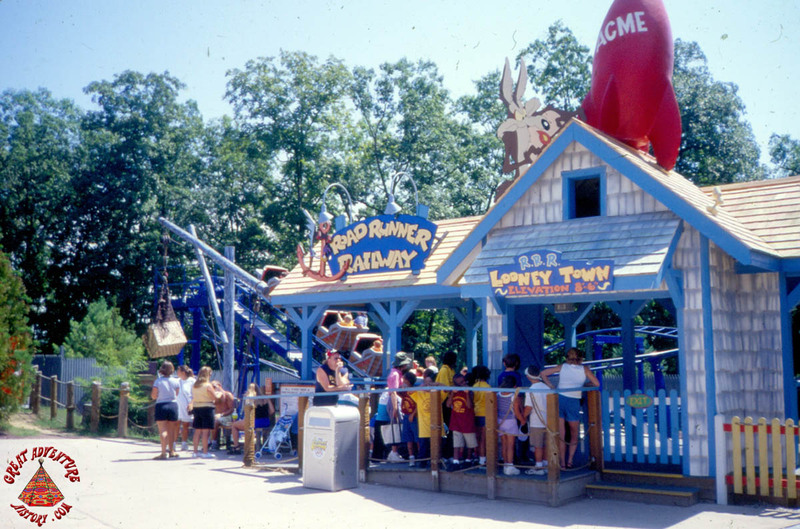 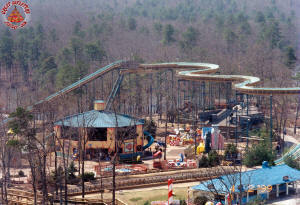 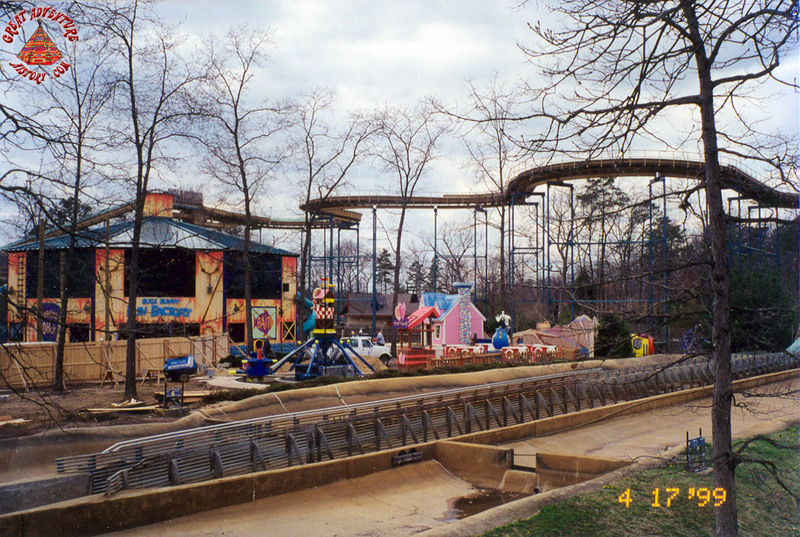 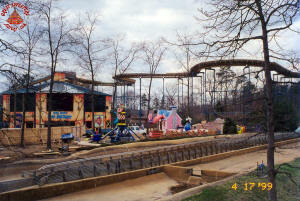 The Road Runner Railway was one of three coasters added for Great Adventure’s War on the Lines campaign of 1999. 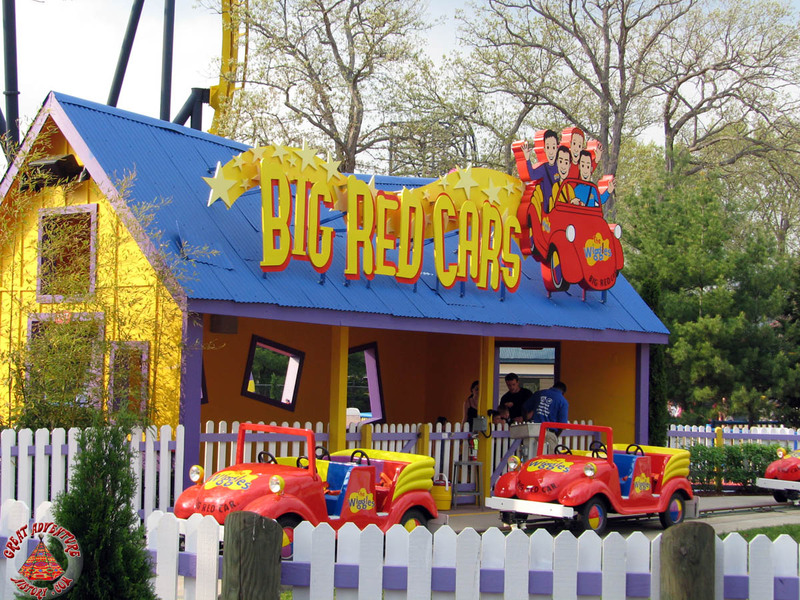 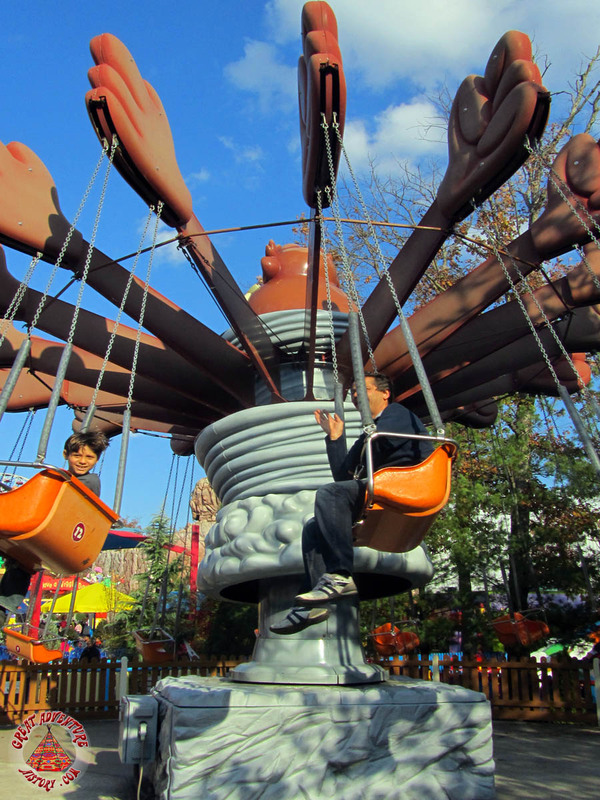 This kiddie coaster proved to be the most popular addition to the Seaport, with consistent lines from both kids and adults to experience the whimsically themed ride. 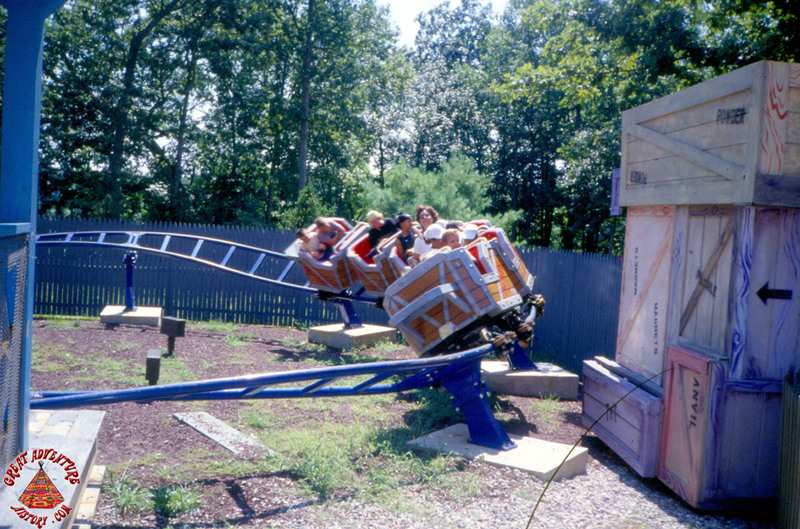 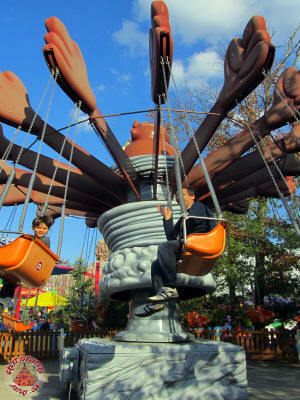 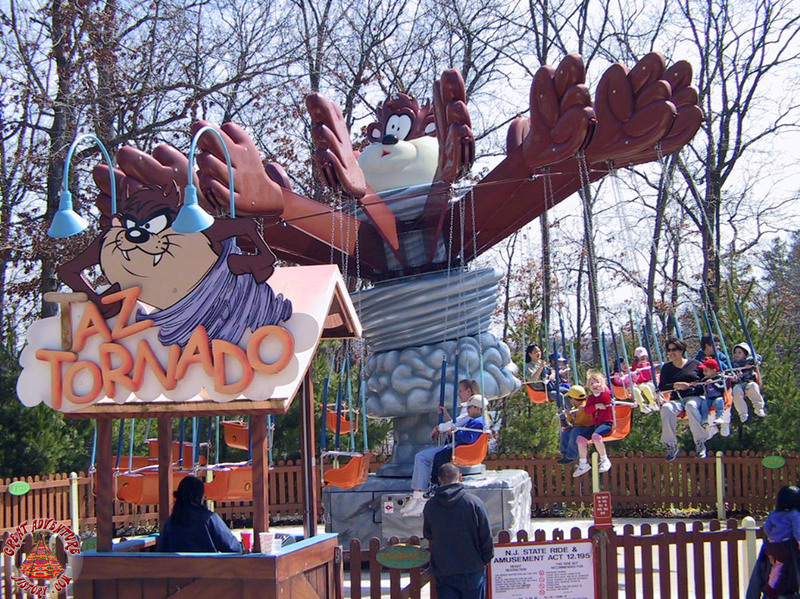 The Taz Tornado is one of the park’s two swing rides, and at the time of its instillation, one of three swings. 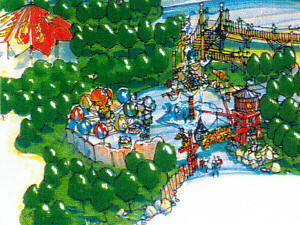 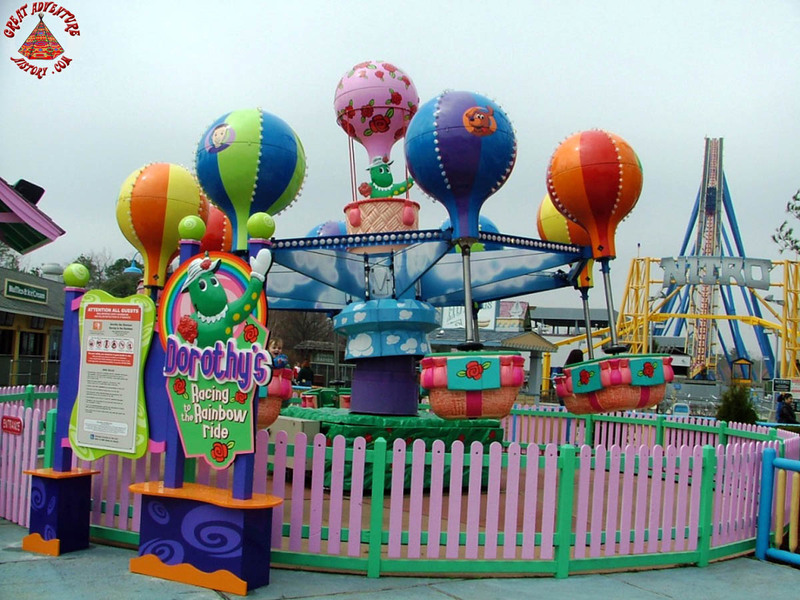 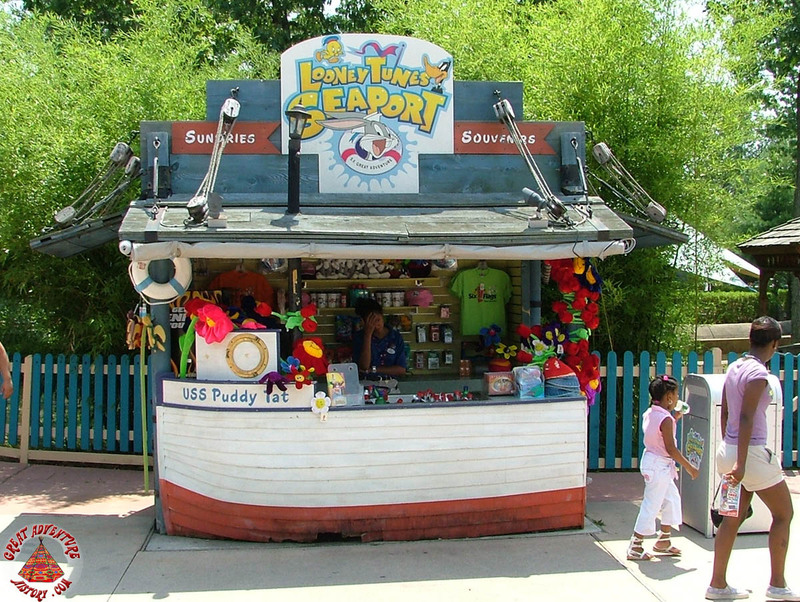 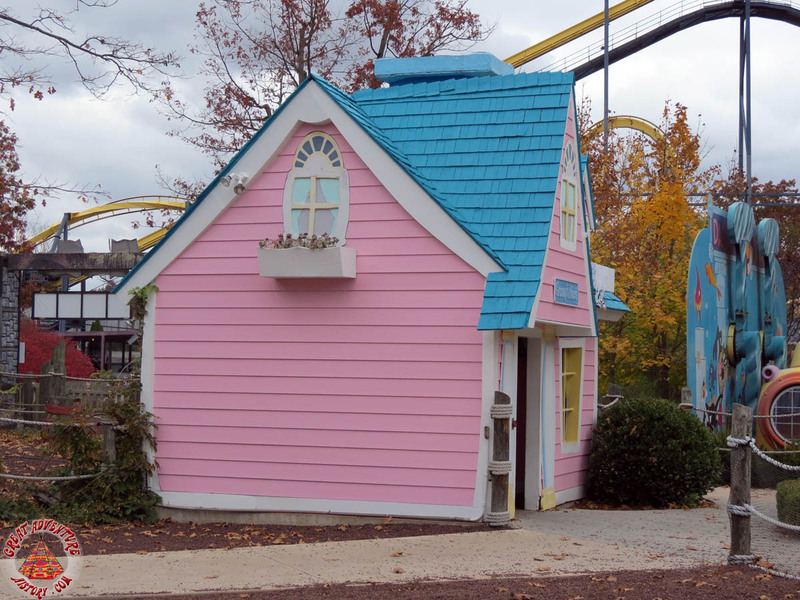 Though ultimately placed in the Seaport with a Taz theme, original plans and park maps from 1999 showed that these swings were to originally be installed next to the Great Character Cafe (Yum Yum Palace) with a candy-theme in the Fantasy Forest under the name “The Lolly Swing”. 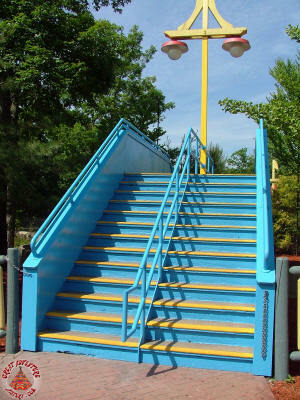 This staircase to the Seaport was the most direct route for guests to enter the area from the Riptide (Hydro Flume) ride. 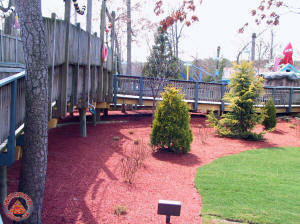 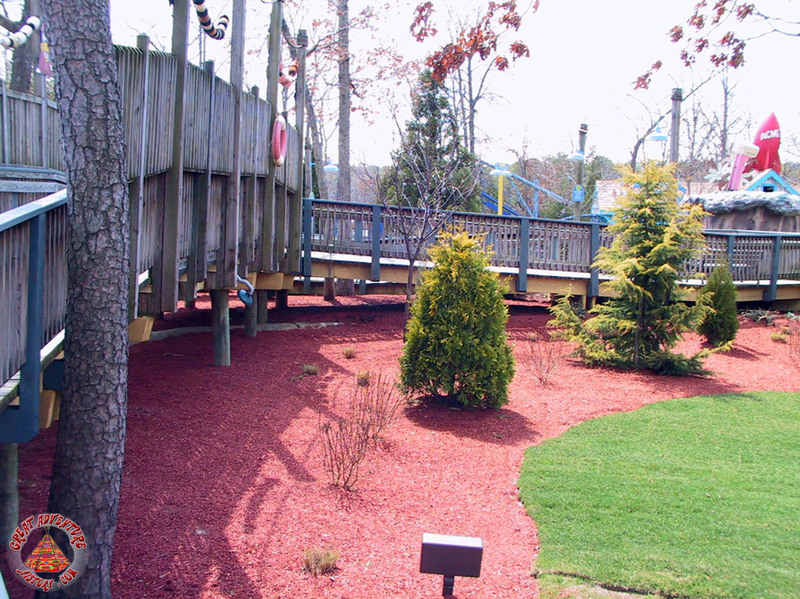 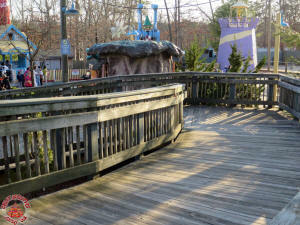 When Riptide was removed in 2006, the stairs were removed and the path was reworked for guests to enter the Seaport from in front of the Big Red Planes/Air Safari. 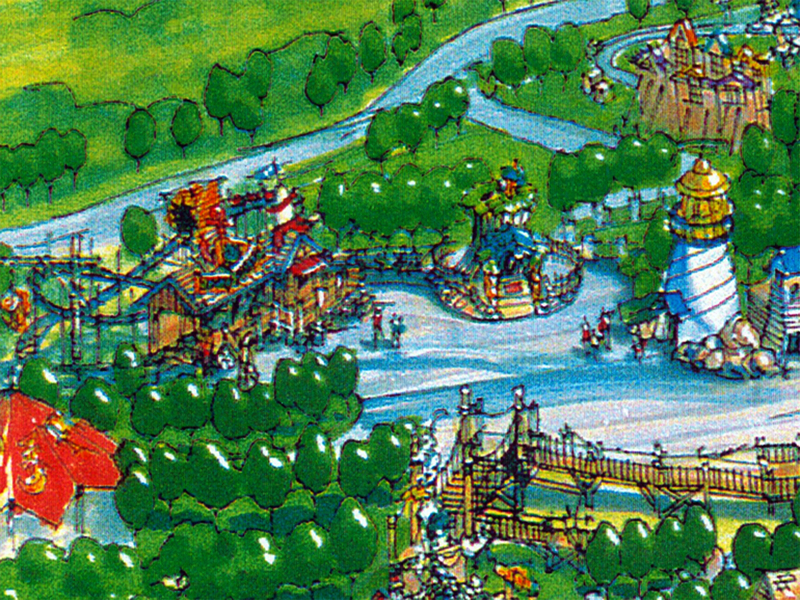 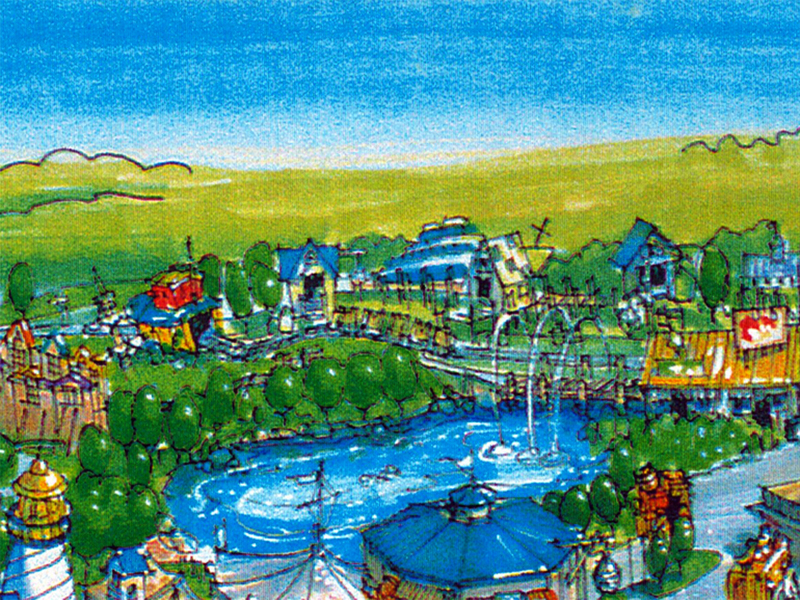 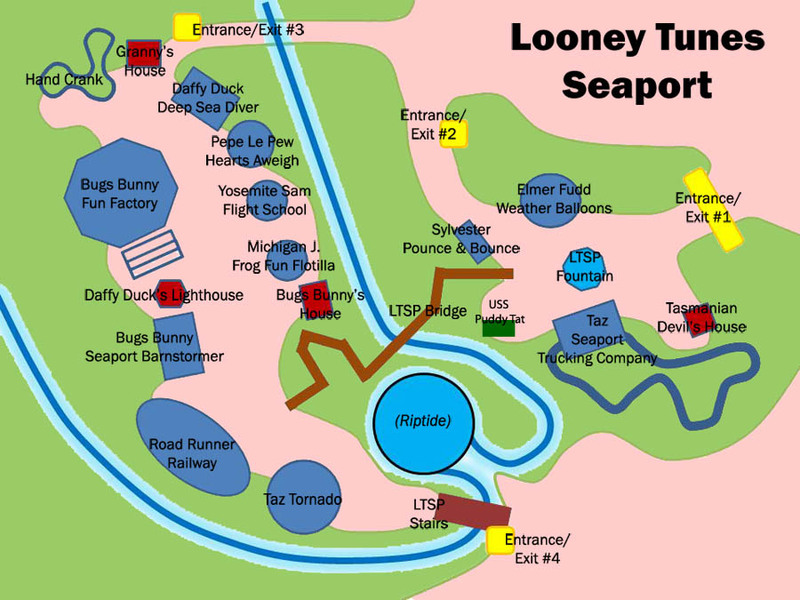 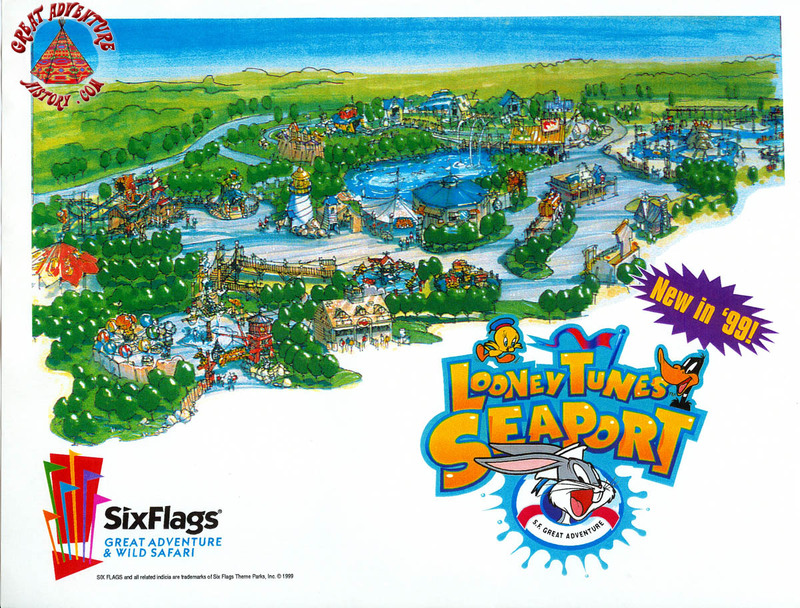 Original renderings map out the footprint of the Looney Tunes Seaport and how it would fit into the existing land formerly occupied by Adventure Rivers. 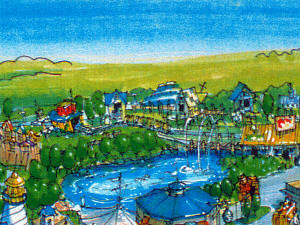 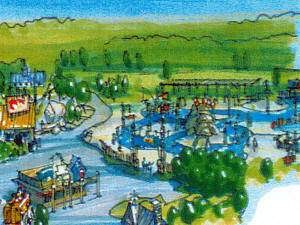 The Riptide (Hydro Flume) ride and Koala Canyon would be reworked into the new section with rides being added around them. 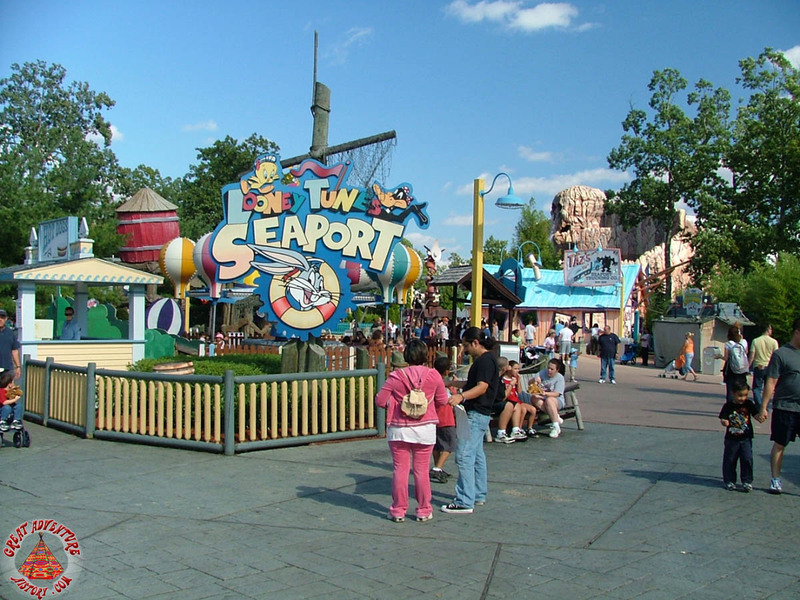 Planned but never built were the inclusion of various sprayers, geysers, waterways and fountains throughout the Seaport as well as some never constructed building facades. On opening day 1999, only the front portion of Looney Tunes Seaport was open and operating however construction crews were hard at work putting the wraps on the back portion of the kids area. 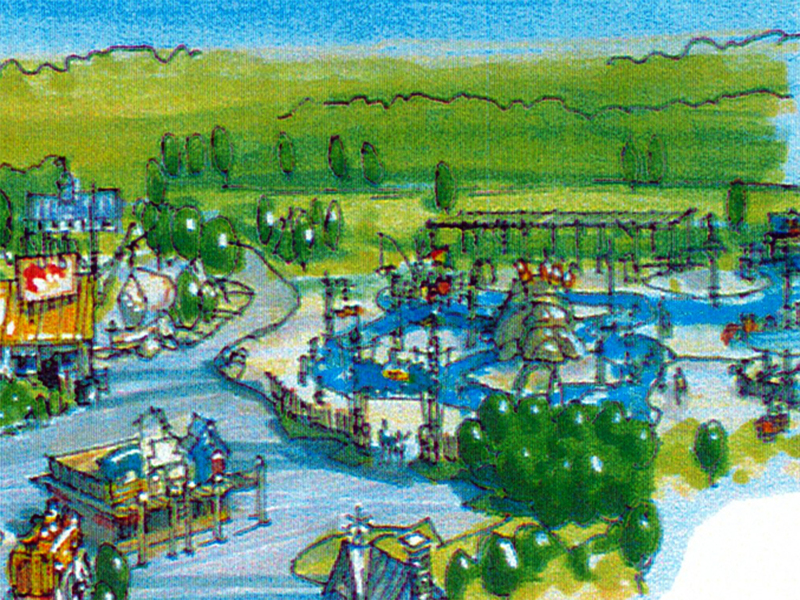 Before it would open, several of the rides would be relocated within the section as last minute changes to the areas layout were debated. 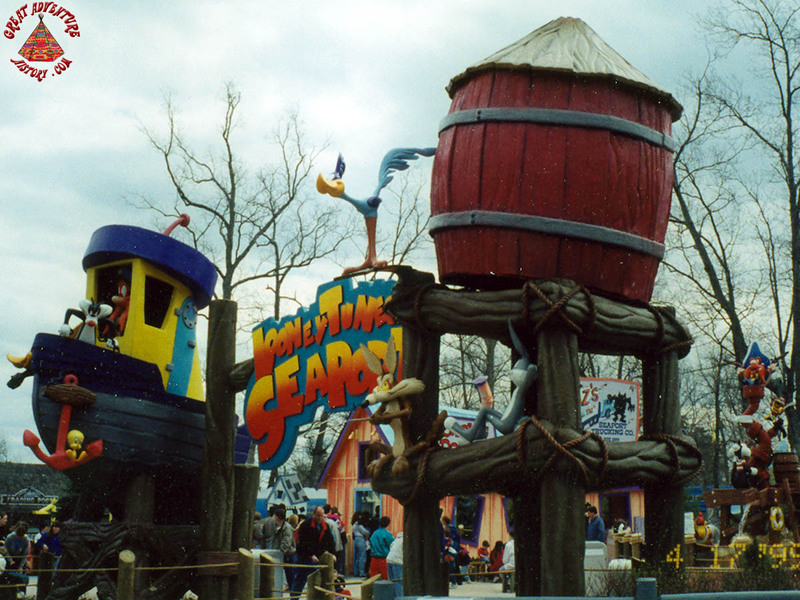 The biggest change to Looney Tunes Seaport was the removal of the Riptide flume ride. 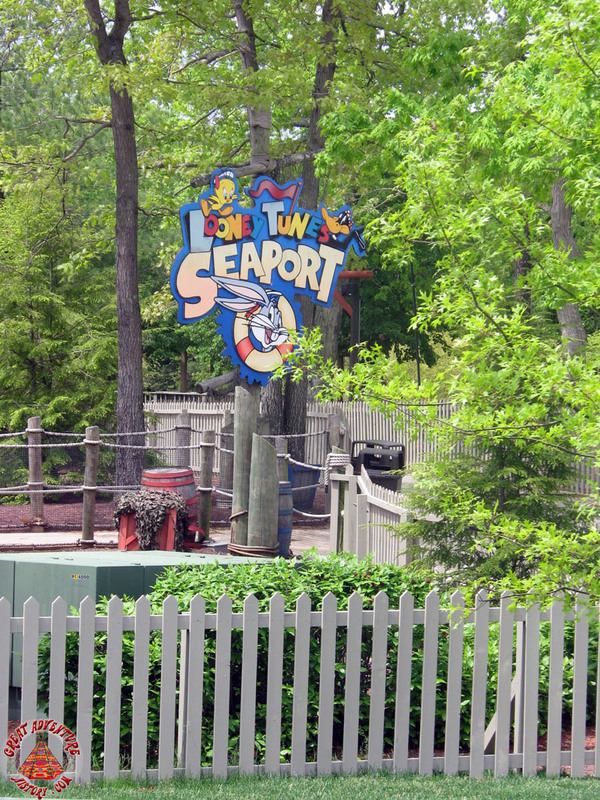 When it was in operation, the moving boats and rushing waters through and above the kiddie area helped carry the theme of a working seaport. 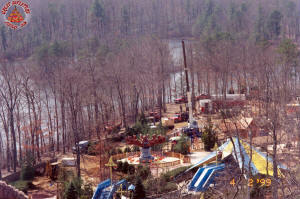 After the flume was removed the section seemed less kinetic especially with the cascading waters into the flume's splash down pool and nearby reservoir. 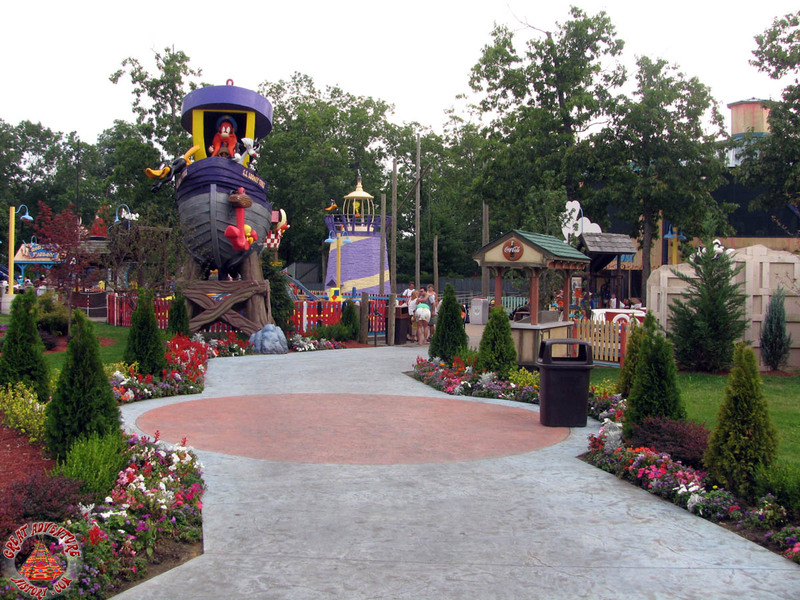 In 2007, the size of Looney Tunes was drastically reduced as the front portion of the land and all its attractions were rethemed to the Wiggles. 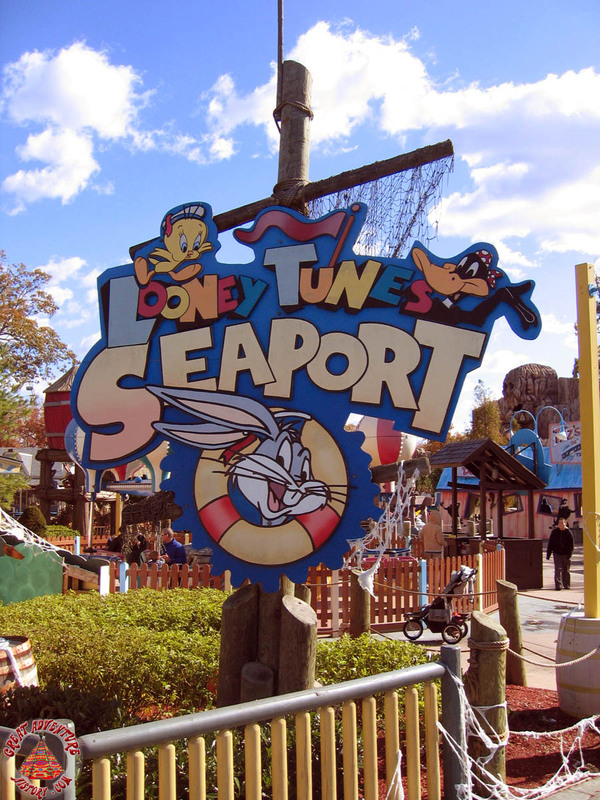 The vibrant colors of the refurbished area outshined what remained of Looney Tunes Seaport as time and weather made what remained of the section a little dull and worn. 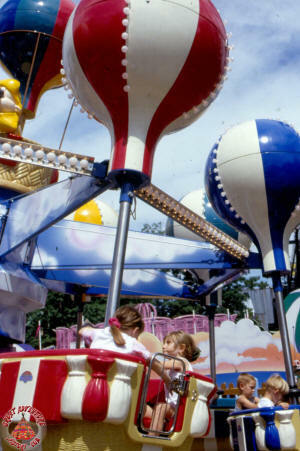 In the years since, several of the rides have been repainted to bring back some of that premiere season glamour. 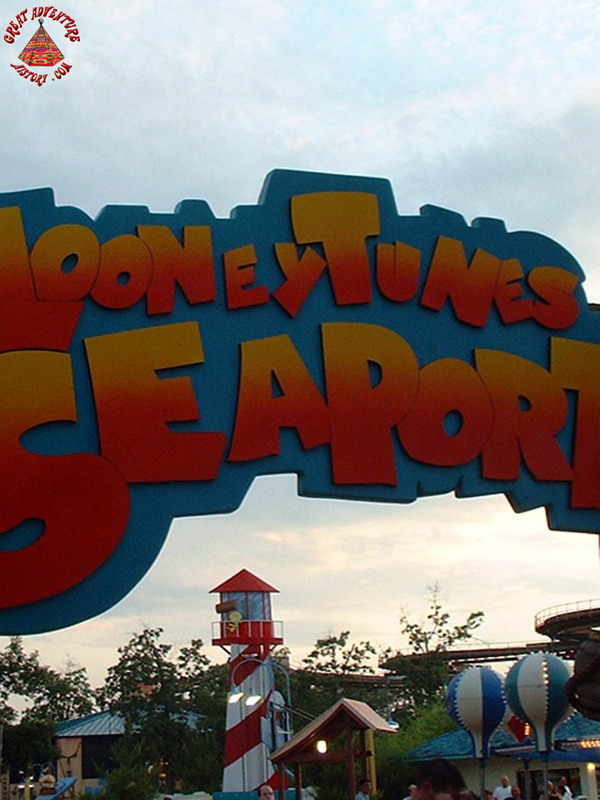 Over the years numerous rides and attractions have been removed from Looney Tunes Seaport leaving empty attraction pads. A few of these have been replaced with landscaping but with fewer things to do, the area's age is beginning to show. 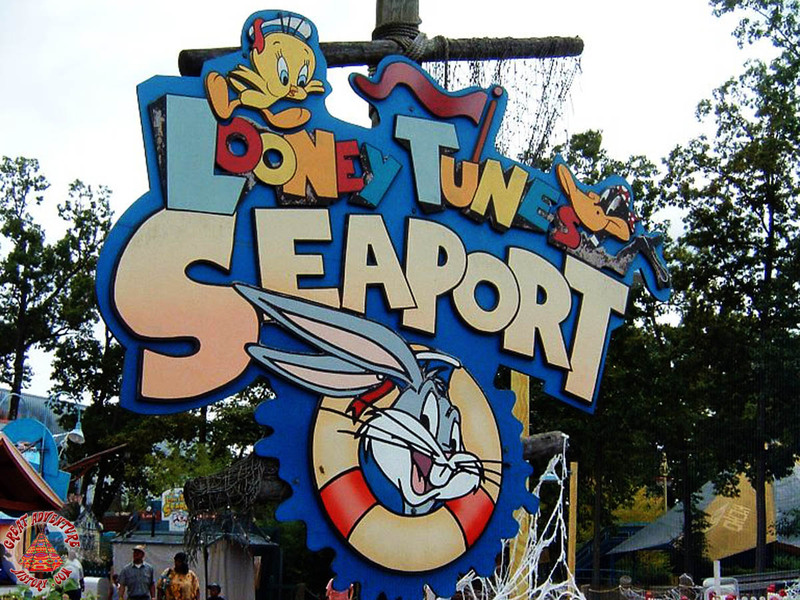 As the oldest of Great Adventure's three children's sections, hopefully Looney Tunes Seaport will be on the park's radar for an update. 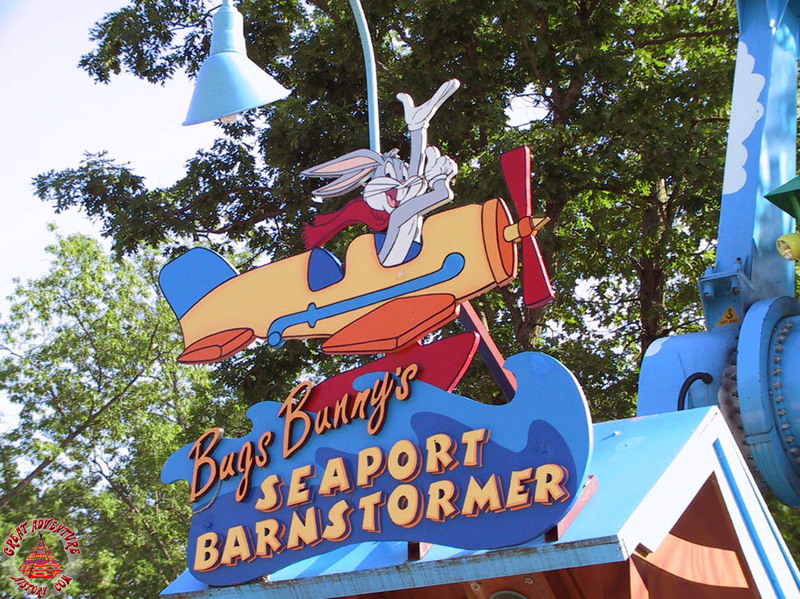 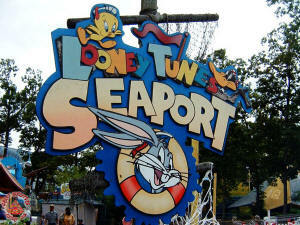 Until then, there is still a lot of fun to be had with Bugs Bunny and his friends at the Seaport!